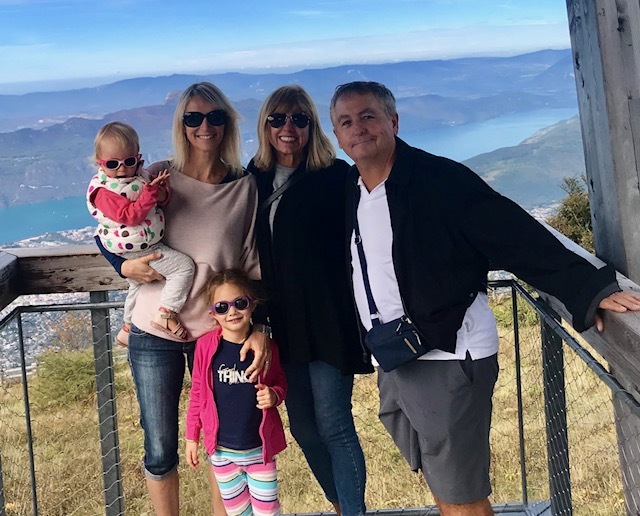 Last stop before going home-visiting our dear friend Aurelie and her adorable family in the Savoie region in southeastern France. Aurelie was a Rotary Youth Exchange student when I coordinated the program for our Rotary club in Bemidji, MN and we enjoy chances to connect with each other. 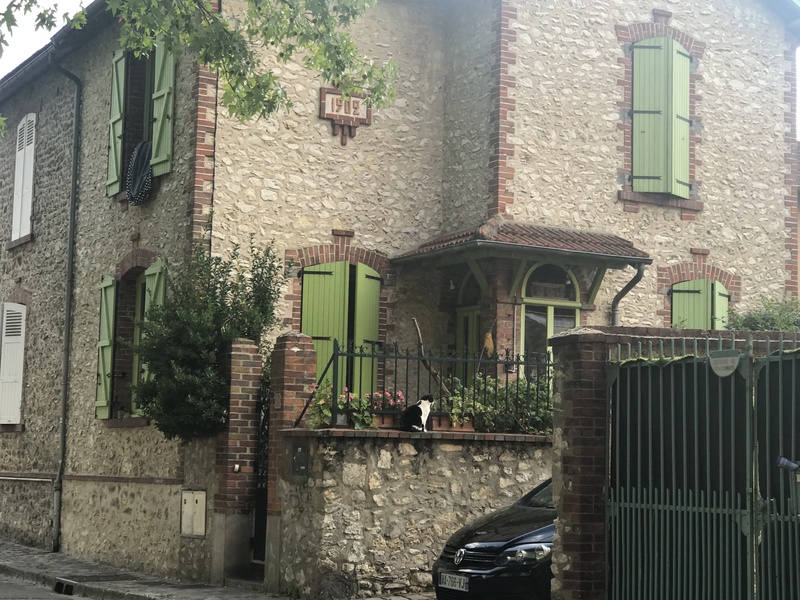 She lives in Chambery, an Alpine city surrounded by beautiful mountains. 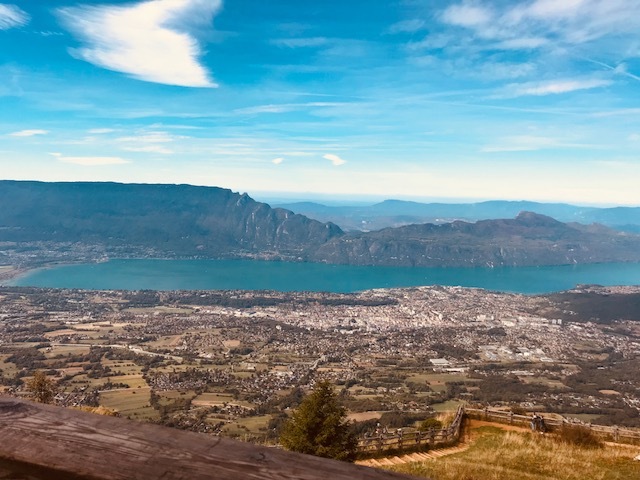 Her home overlooks beautiful Lac du Bourget, the largest natural lake in France. 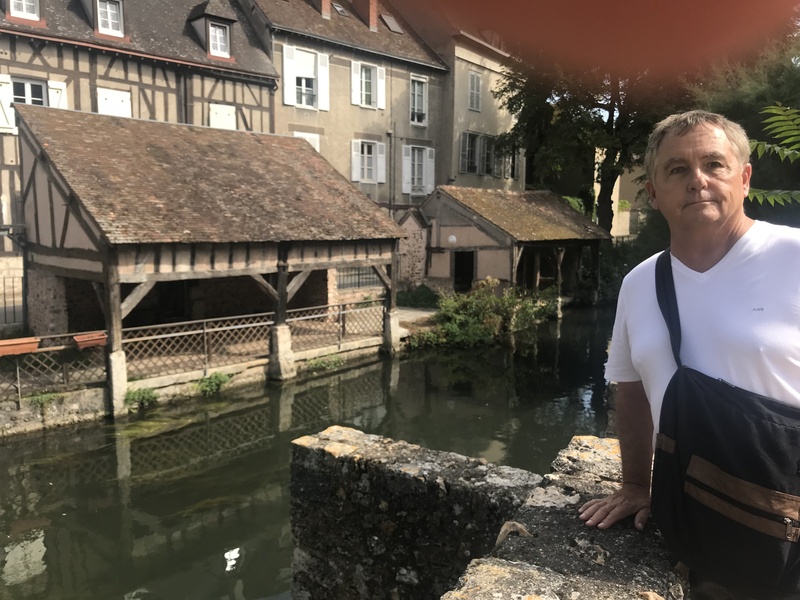 We were disappointed that Jeremy, Aurelie’s husband, was away, but we had a wonderful time touring the area with her two daughters. We drove to a ski area atop the highest peak on the other side of the lake. 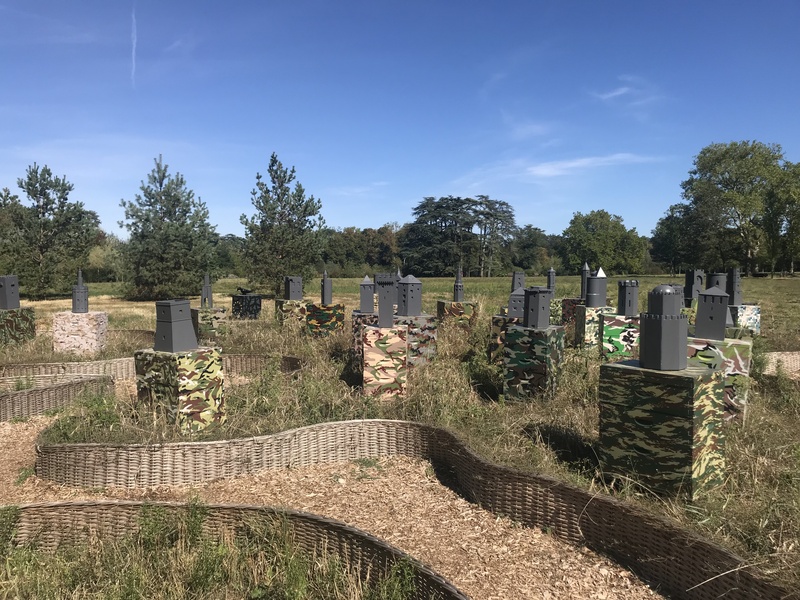 The area attracts outdoor enthusiasts year round. It is a popular spot for boaters in the summer and skiers in the winter. 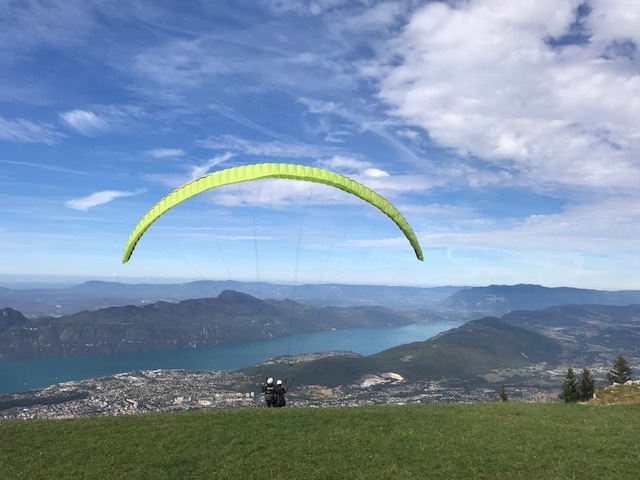 We enjoyed watching the para gliders taking off over the valley and saw a young woman going on her first glide with an instructor. 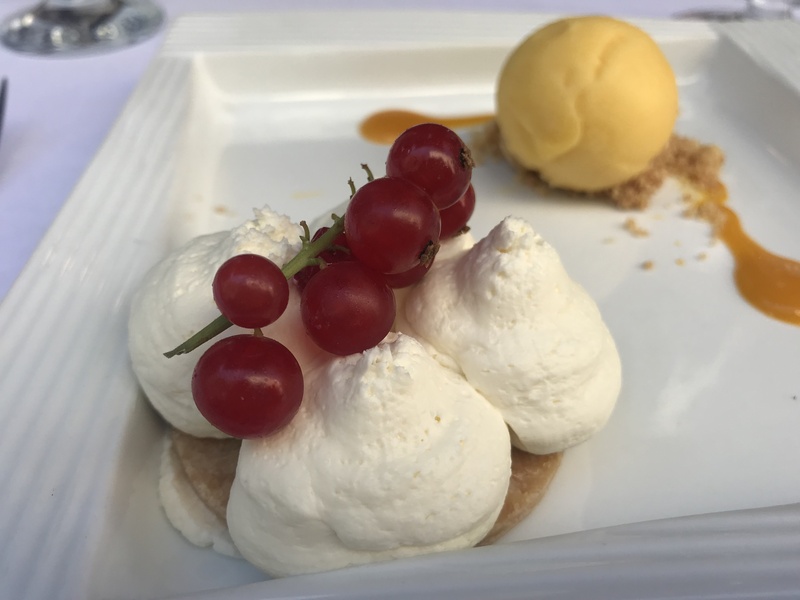 We ended our lovely day with a delightful dinner at Beaurivage, one of Chambery’s oldest gastronmique (gourmet) restaurants. 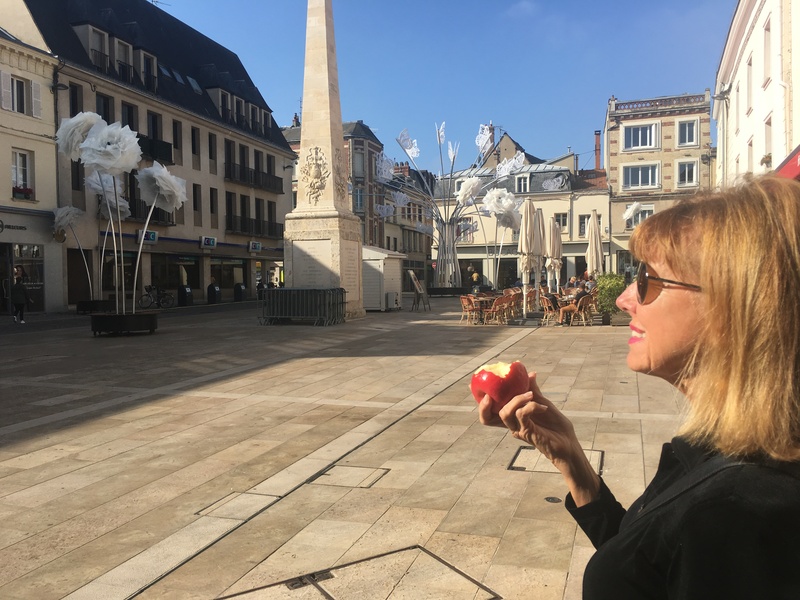 Paul put together a little video of our last few days in France. 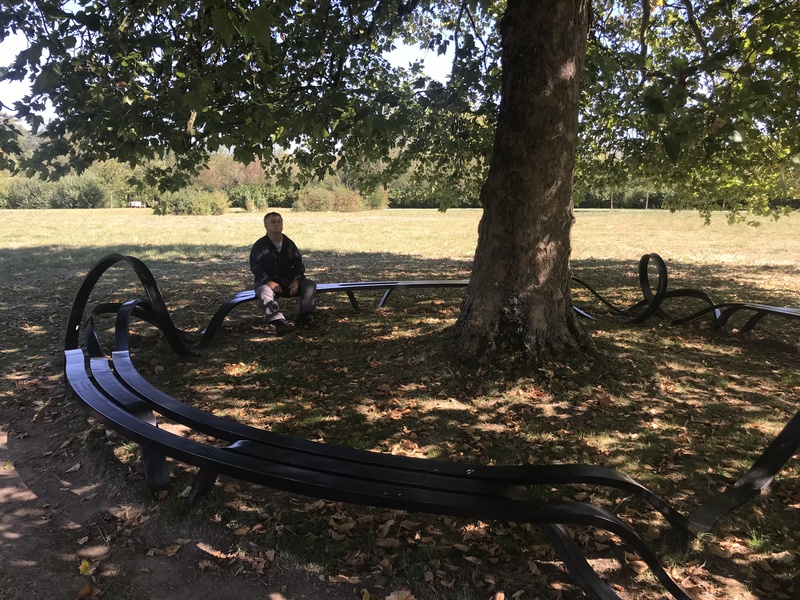 This entry was posted in France 2018 on September 23, 2018 by debbie. 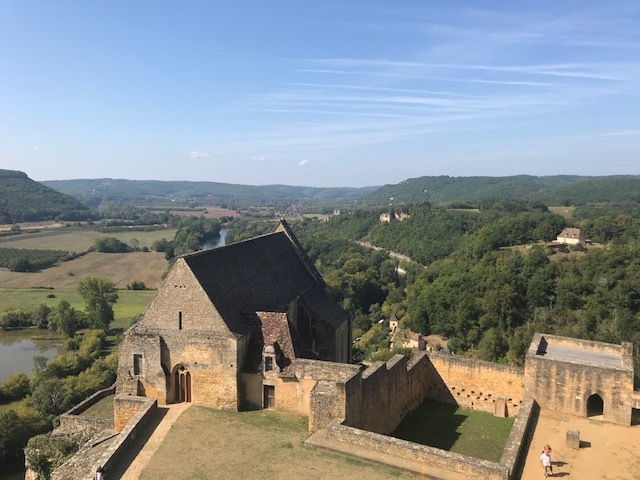 We spent our final day in Sarlat at the impressive Chateau de Beynac, a 12th century castle about ten miles southwest of Sarlat. 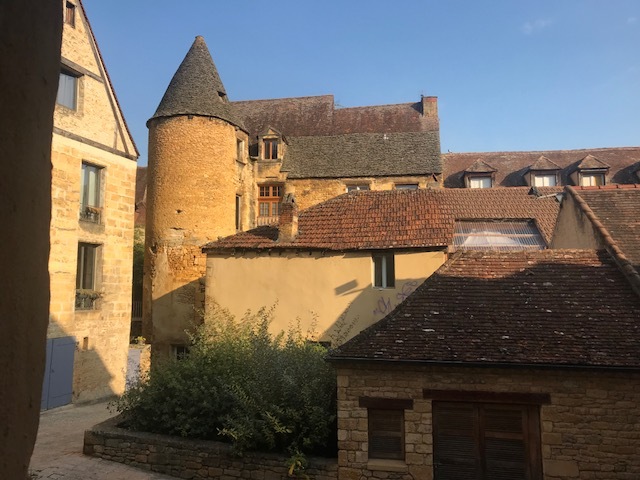 Exploring the amazingly well-preserved 900 year-old building and grounds was one of our favorite Sarlat experiences. 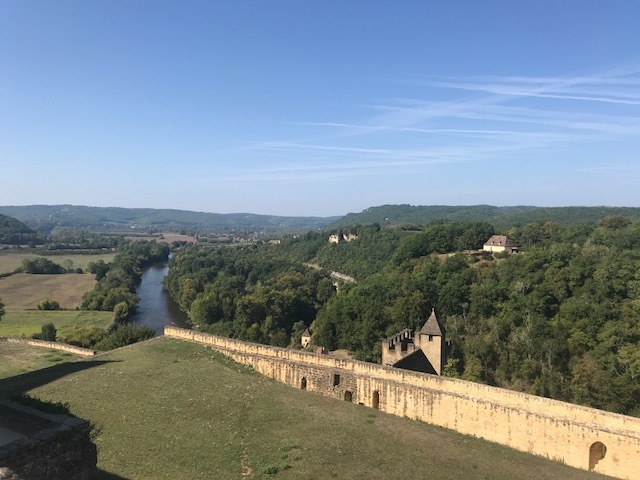 Originally designed to be a fortress, the castle sits against rock cliffs looking out over the Dordogne river and provides amazing views of the beautiful surrounding countryside. The audio guide information about the castle and life in the 12th century was so compelling that I listened to all the supplemental segments before returning the guide. Like many of the places we have visited on this trip, there were surprisingly few people around. It was great to tour the inside of the castle and have it almost to ourselves. 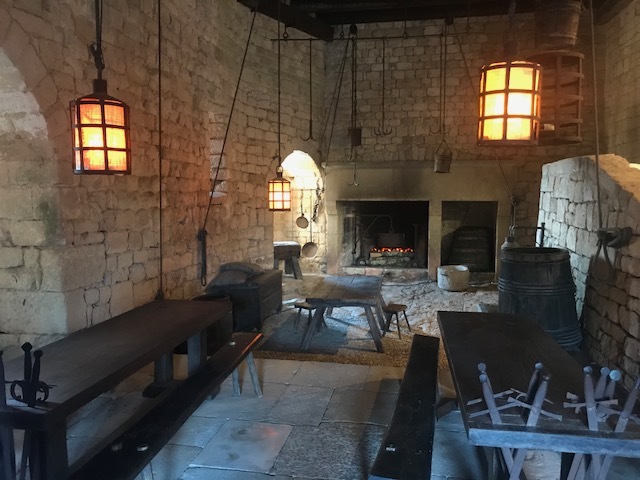 The kitchen was added during a renovation in the 13th century. 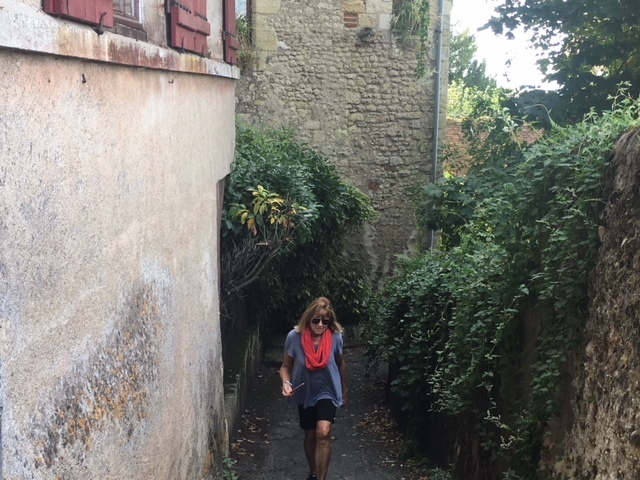 After our visit to the castle, we hiked a little trail that led down the hill away from the castle. 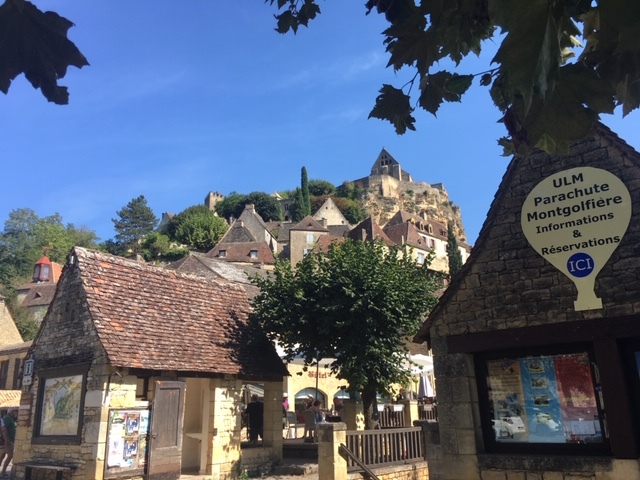 On a whim, we decided to drive through the nearby town of Beynac on our way home. I am so happy we did not miss seeing this charming town with its narrow streets and hilltop-hugging buildings. We like to buy a piece of artwork from our trips but we hadn’t seen anything we wanted on this trip-until today. 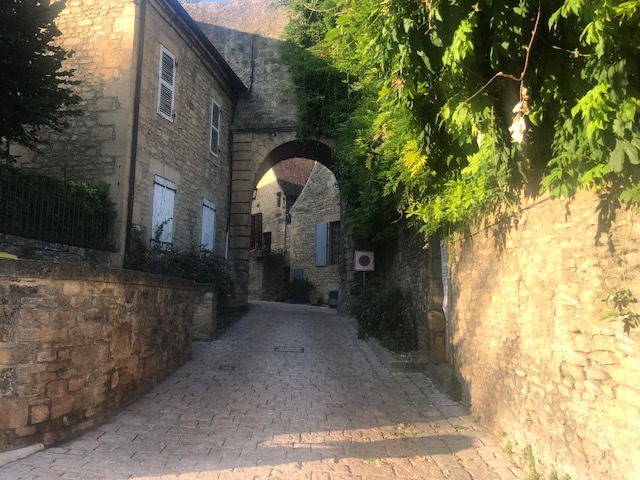 While on a little before-dinner walk we passed a gallery and found a water color of Sarlat that we loved. The only downside was that we found the gallery at the beginning of our walk, so the picture went on our walk with us. As we left our apartment for dinner I noticed the rising moon and a beautiful blue sky. 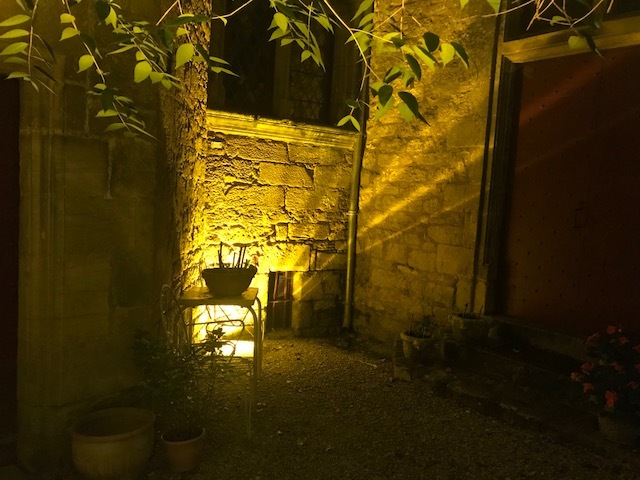 Our last dinner in Sarlat at Le Presidial was one of the best of our trip. 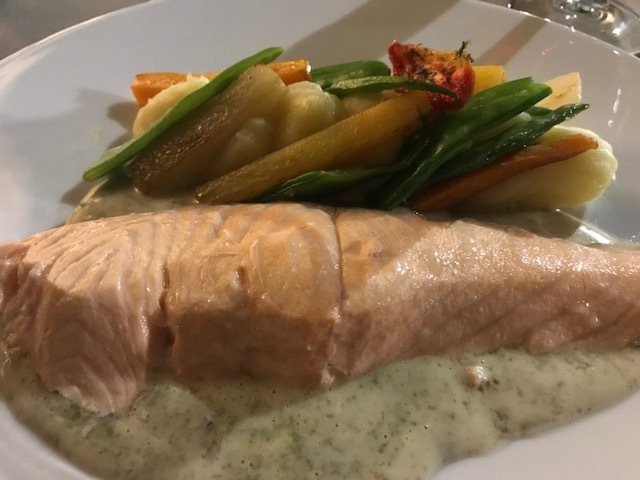 I had salmon in sorrel sauce with perfectly prepared vegetables. 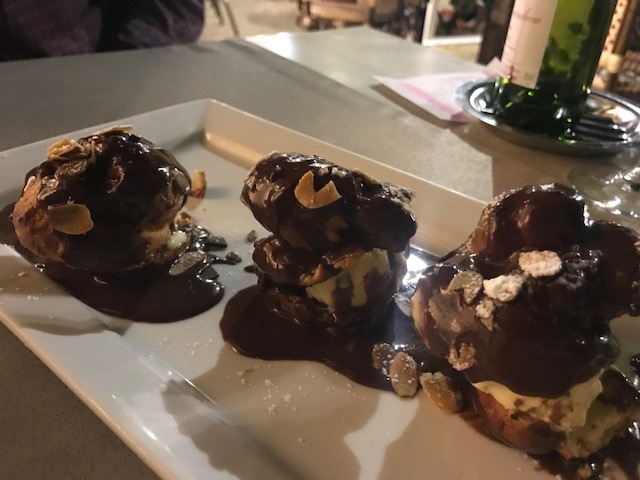 The beautiful and delicious profiteroles were a perfect ending to our delightful stay in Serlat. 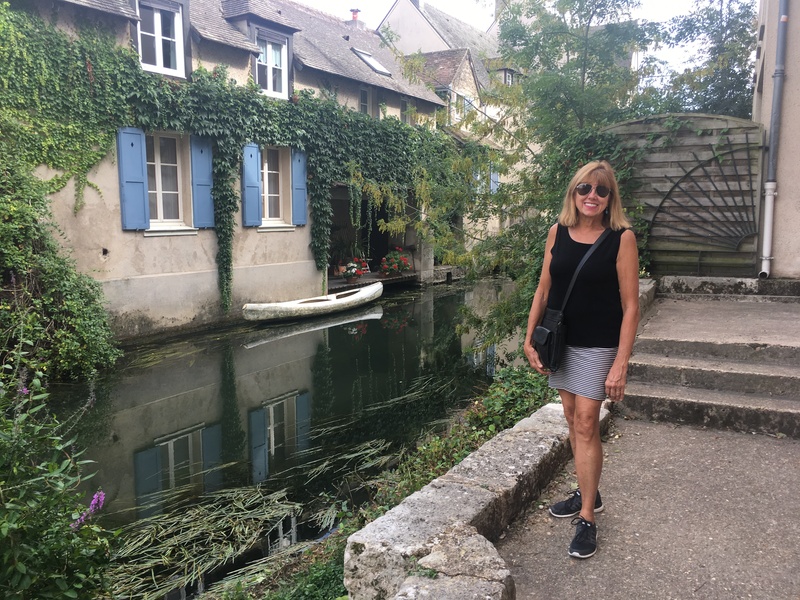 This entry was posted in France 2018 on September 21, 2018 by debbie. 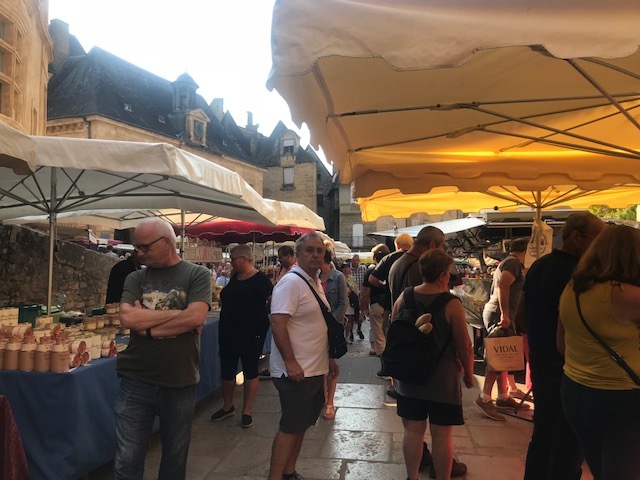 Wednesday is one of two market days in Sarlat, and we went to the market with a mission-find the best bread, cheese, vegetables and fruit to make dinner at home. It was fun to look at all the beautiful products. 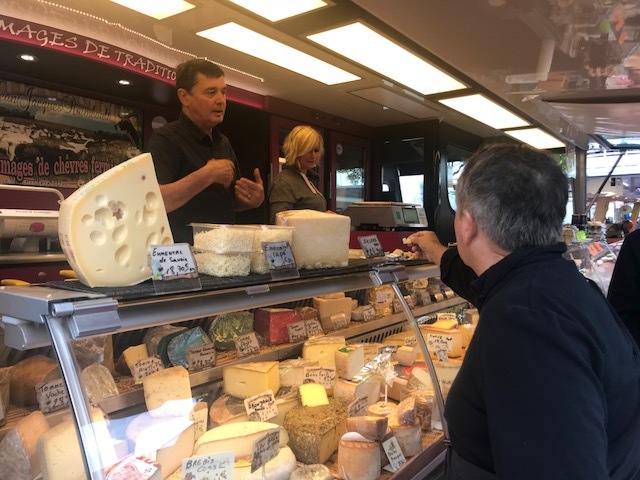 Our favorite encounter was with the cheese vendor who told us cheese made by his grandparents tasted like new love. Who could resist that? The friendly baker selling walnut bread made buying his bread fun. Carrots, green beans, olives, melon and apples completed our dinner shopping. Our fruit vendor asked if we wanted to eat our melon today or tomorrow and chose the best melon accordingly. 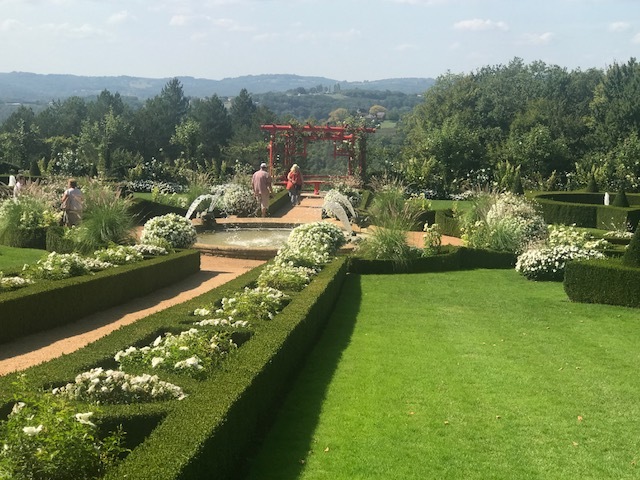 After a quick trip home to stow our purchases, we drove about fifteen miles east of Sarlat to visit the lovely Eyrignanc et ses Jardins, billed as the most beautiful gardens in the Perigord region of France. The same family has owned these gardens for 500 years. 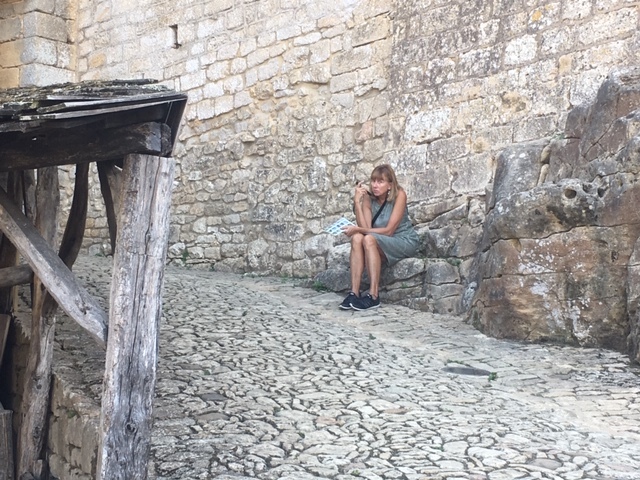 It was another hot day in Sarlat, and the loveliest part of the visit may have been relaxing in comfortable chairs on a cool and shady hill. 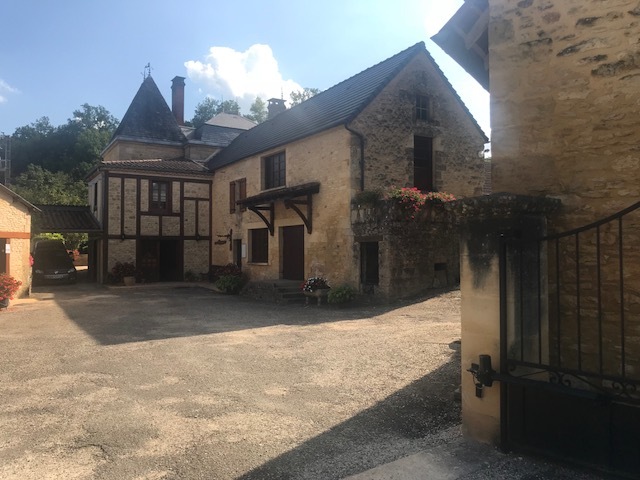 On the way back to Sarlat, we visited Moulin de la Tour, a 16th century mill producing natural walnut oil in their ancestral way. 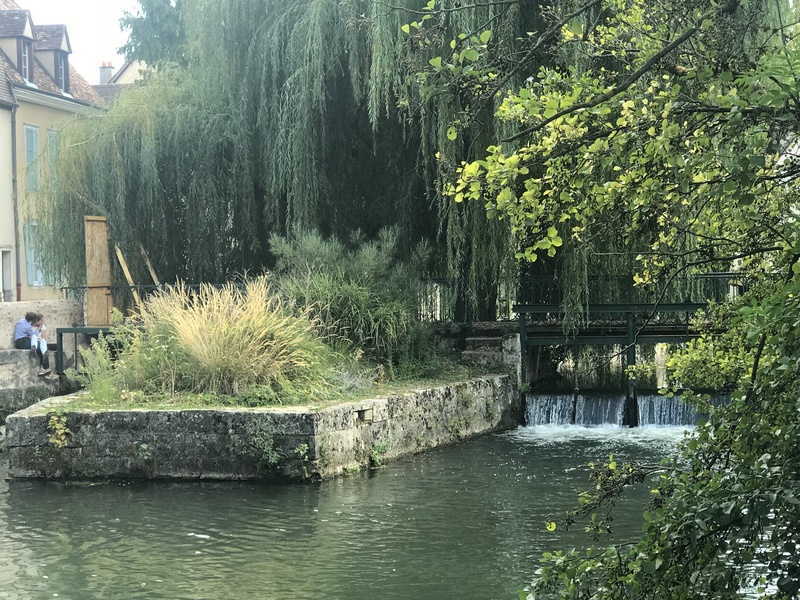 The ancient mill is powered solely by the L’Enea river. A charming couple own and operate the mill along with their daughter and son-in-law. 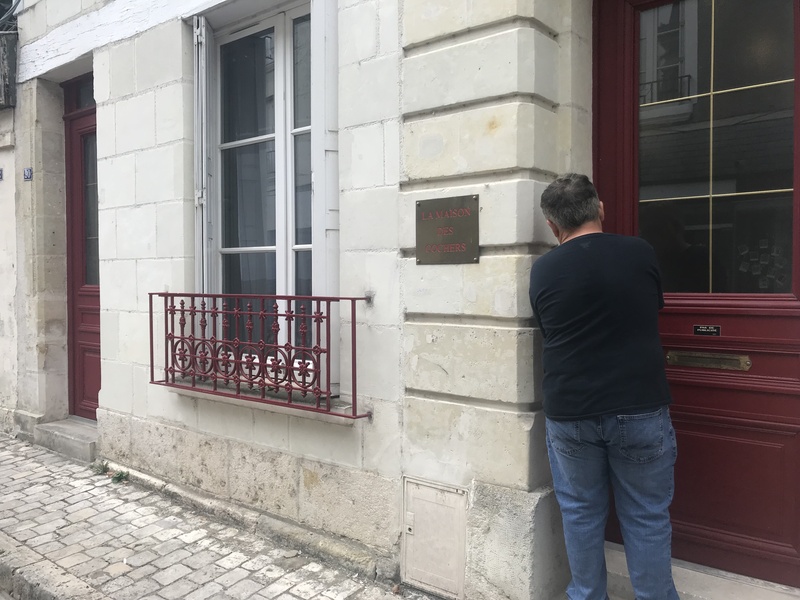 The husband, who gave the tour, spoke only French, but prior to the tour his wife gave us an information sheet in English, and I could translate a little bit of the tour for Paul. 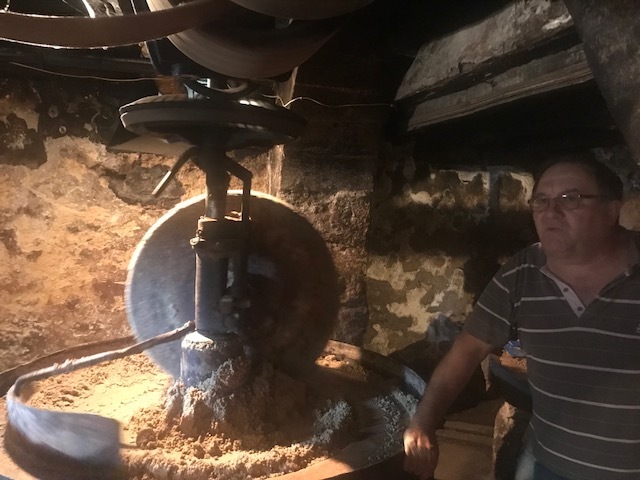 They purchase walnuts shelled by hand and then grind and process them. 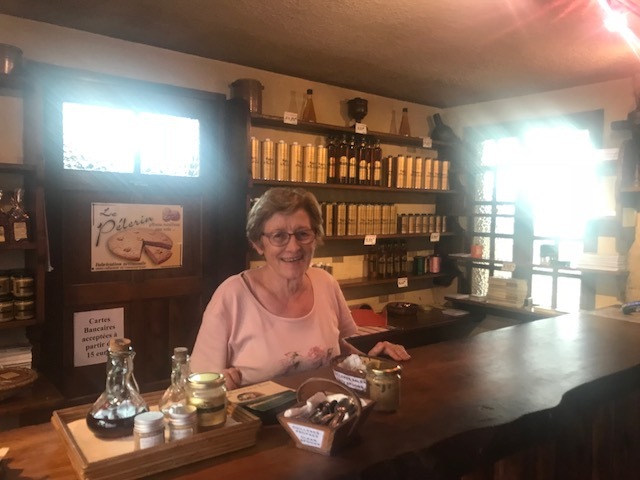 In spite of the wife’s limited English and my limited French, we had a delightful conversation about walnut oil, family, Florida and hurricanes. 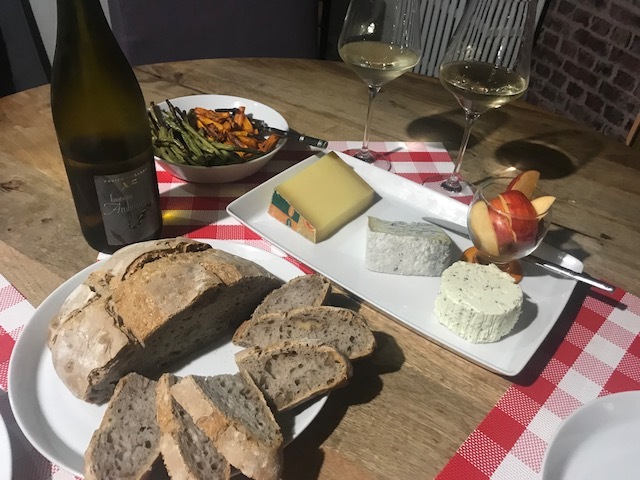 After a lovely day in the Perigord countryside, we returned to our apartment and made our market dinner. Phillipe, our host, had to come over and show us how to turn on the gas oven so I could roast the vegetables. And then we couldn’t turn off the oven because the knob was broken. With a little phone guidance from Phillipe, Paul figured out a hack to turn off the oven and all was good. 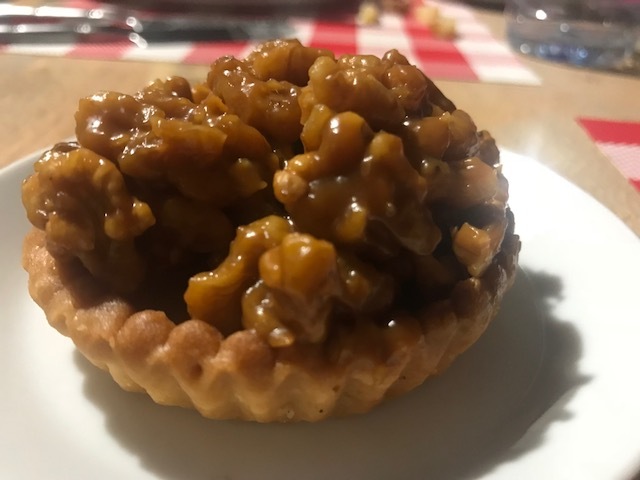 A lovely walnut tartlette was the perfect finishing touch to our market dinner. 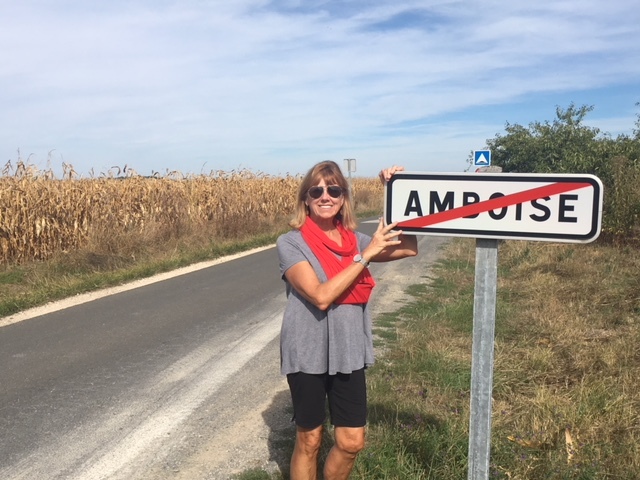 This entry was posted in France 2018 on September 20, 2018 by debbie. 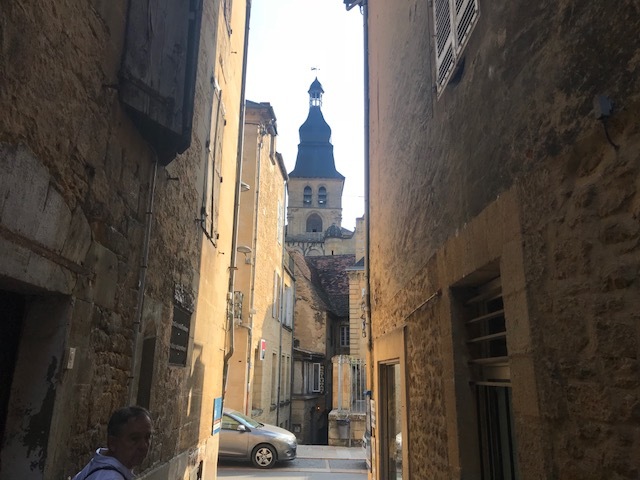 Sarlat-la-Caneda, a medieval town is southwestern France, is cute, cute, cute. 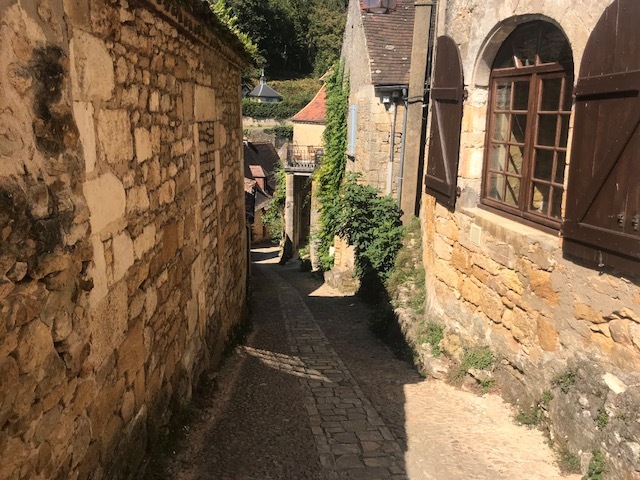 Exploring the narrow streets that meander between golden stone buildings is like stepping back into 14th century France. 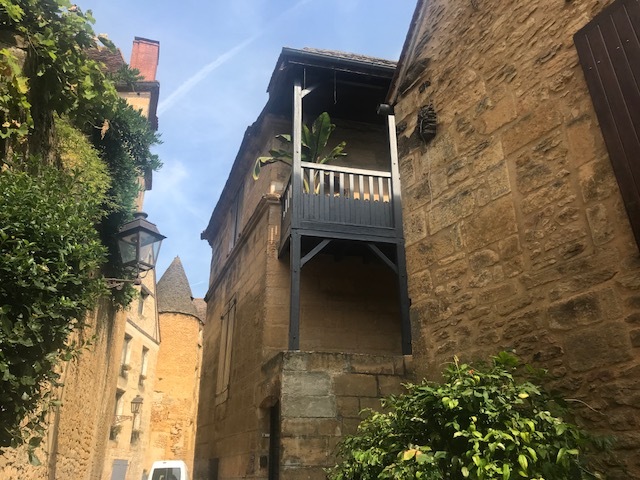 Our two-story apartment is in an 17th century building and has an outside stairway to get from first level to the second. Every window in our apartment opens to a beautiful view. When the sun sets the city offers beautiful new scenes. 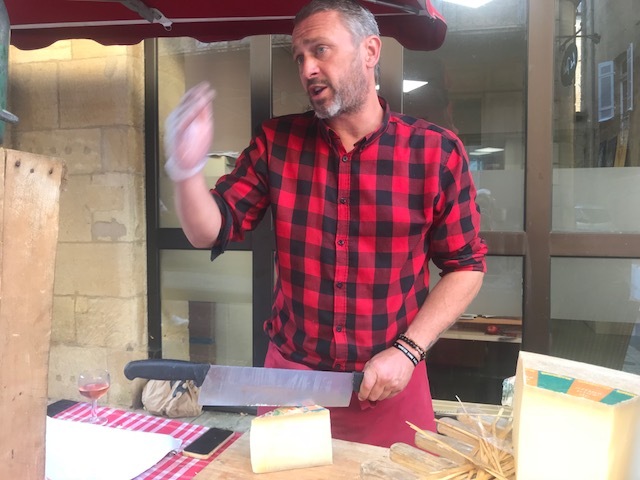 Sarlat is a paradise for lovers of foie gras, one of the three main products of the area along with truffles and Perigord walnuts. Foie gras is made from the liver of a duck or goose that has been forced fed corn. 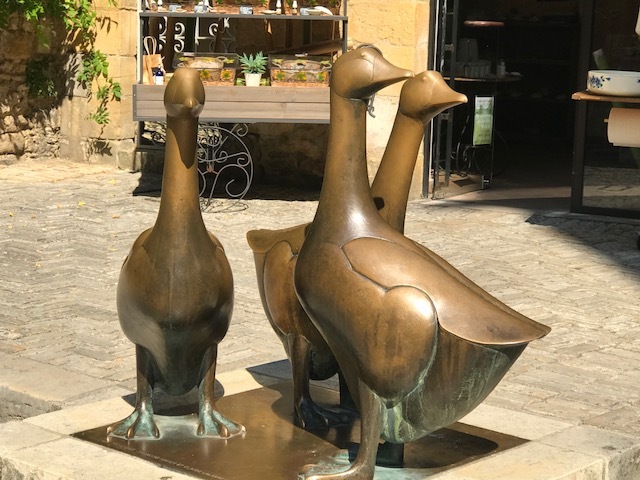 A statue of geese figures prominently in the middle of the Place des Oies, Square of the Geese and Sarlat holds a geese fair every year on the third Sunday of February. I think this is cruel and won’t eat foie gras which makes it a bit challenging to order a meal because foie gras dominates most of the menus here. Duck, in all its many preparations, also figures heavily in the local cuisine. 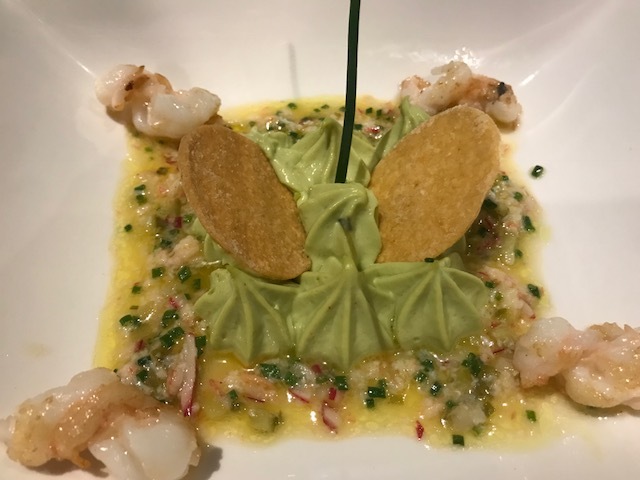 A positive outcome of this dining challenge is that we have improved our ability to translate menus and have eaten some great meals. 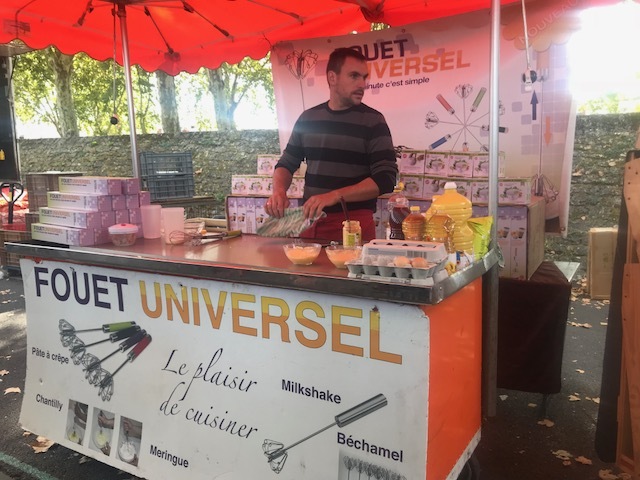 This entry was posted in France 2018 on September 19, 2018 by debbie. 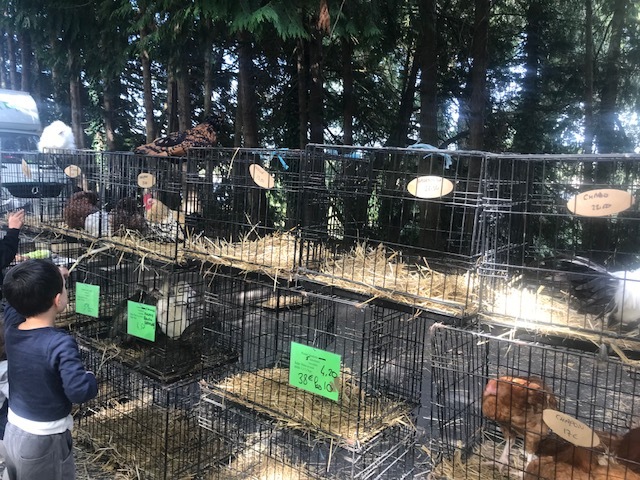 I love going to French markets. The flowers and produce are beautiful; the prepared foods are enticing; and the people watching is the best. I almost always see some unfamiliar food item, and I am constantly amazed that people will buy clothes without being able to try them on. 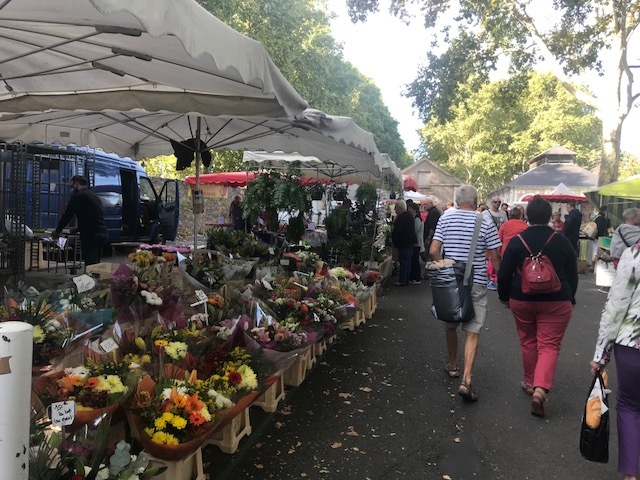 The Sunday market in Amboise, the largest in the Loire Valley, met all my market expectations today. 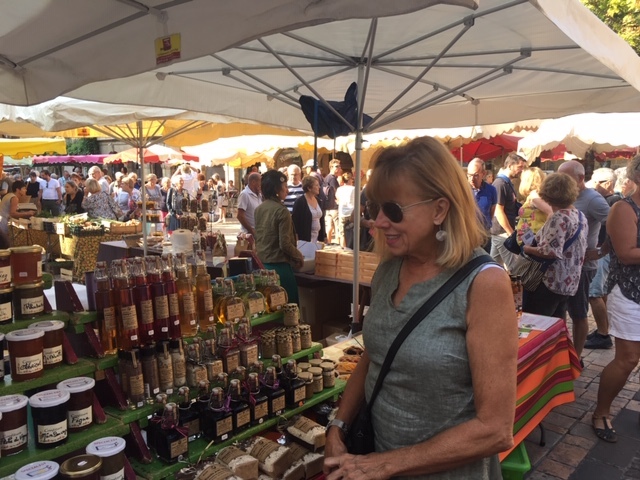 It was an absolutely perfect day to stroll the market and enjoy the beautiful sights and smells. After trying some delicious cheese, we chose two, one an old favorite and one brand new to us, for our lunch. 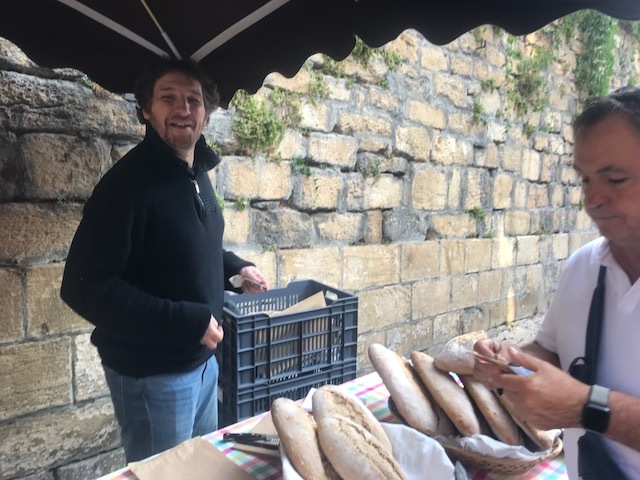 We got a fresh baguette and a beautiful lettuce at other stands and were set for a great lunch from the market. and a vendor selling the exact same “magic” egg beater we bought at the state fair years earlier. 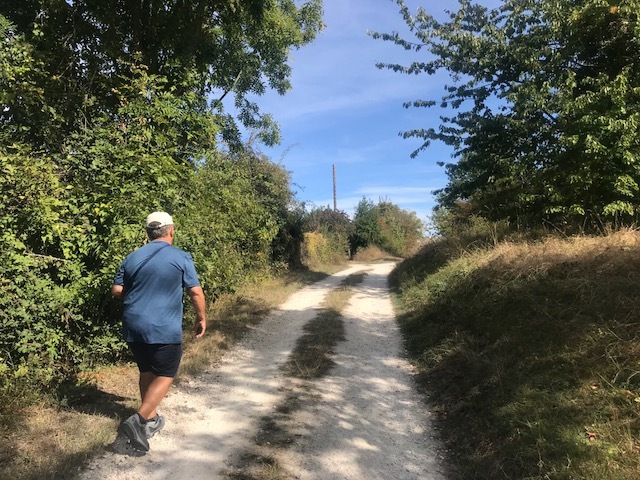 After lunch and a brief nap to recover from our great market lunch and local wine, we set off on one of Paul’s famous walks. 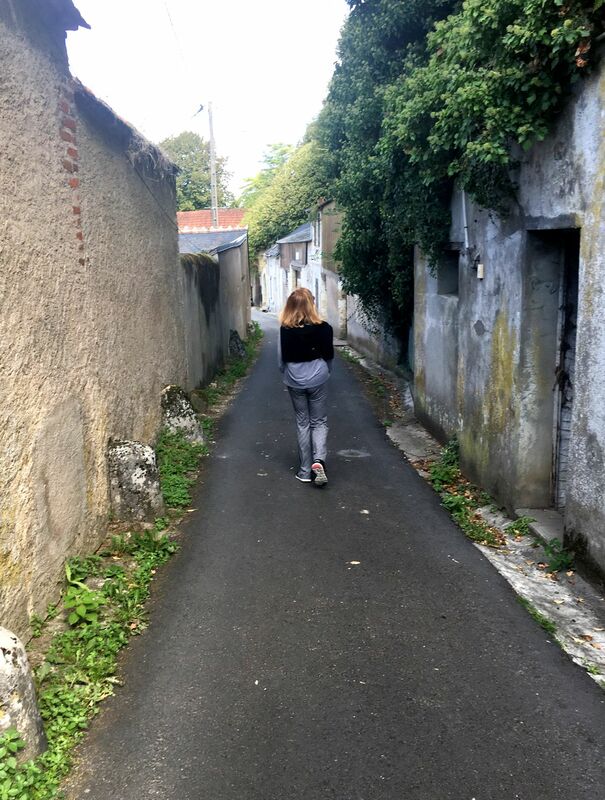 We love walking explorations of new cities. Paul does a great job plotting routes that take us to areas we would never see otherwise. In the past he used the CityWalks app, but this time he used a new app, MapMyWalk. In a very short time we were out of the city and heading down a dirt road. 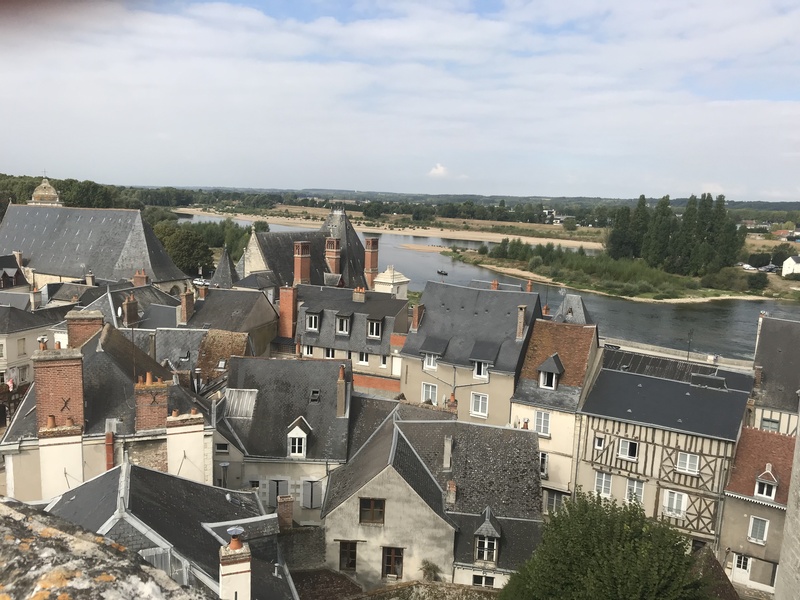 and saw a beautiful view of Amboise below. Part of our walk was outside the city limits. 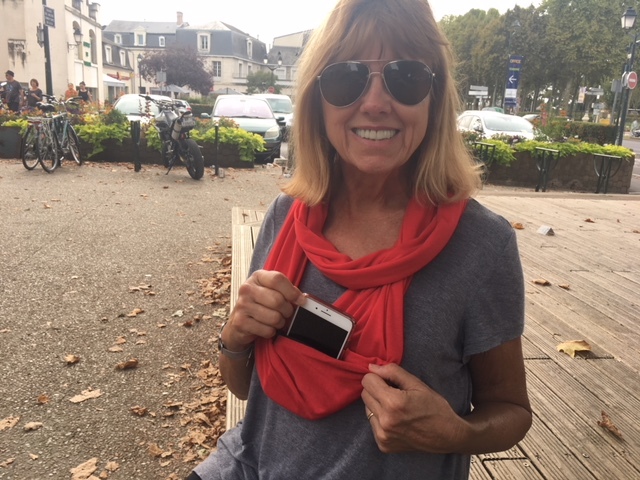 I am a sucker for gadgets and was excited to try out my scarf with a hidden pouch for keys and phone. It sounded like a great idea when I ordered it, but in reality, it was hard to get my phone out of the pouch. I will go back to using my trusty cross-body travel bag that I have had for more than twenty-five years. I will be sad to leave this charming city tomorrow, but I know I will return and plan to stay longer on my next visit. 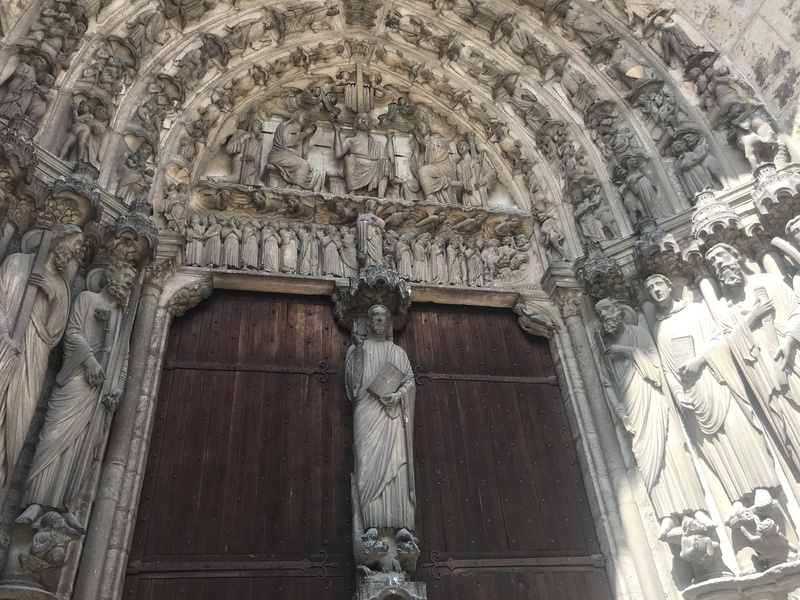 This entry was posted in France 2018 on September 16, 2018 by debbie. Many of my favorite travel experiences are unplanned; we discover something while on a walk or notice a poster or pick up a pamphlet. 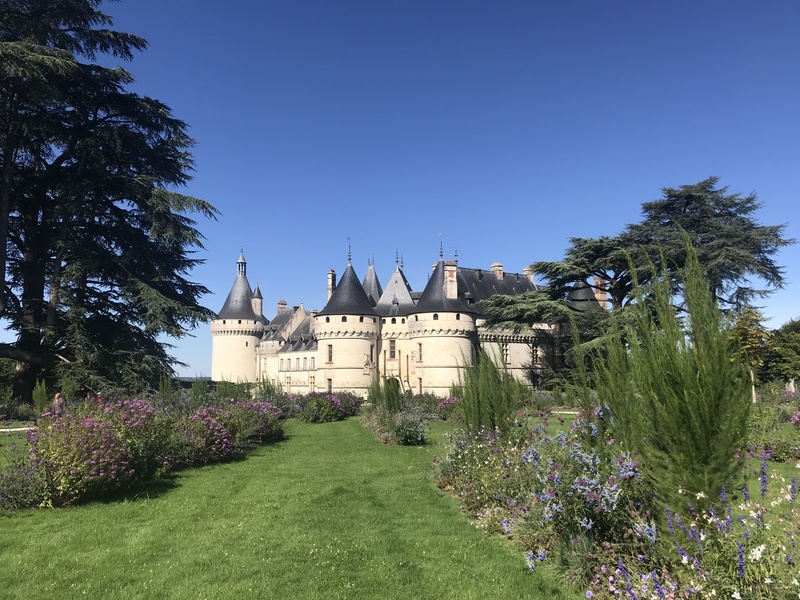 We decided to visit the Chateau Chaumont-Sur-Loire because I picked up a pamphlet when we were in a cheese shop yesterday about an international garden festival and contemporary art installation at the chateau. 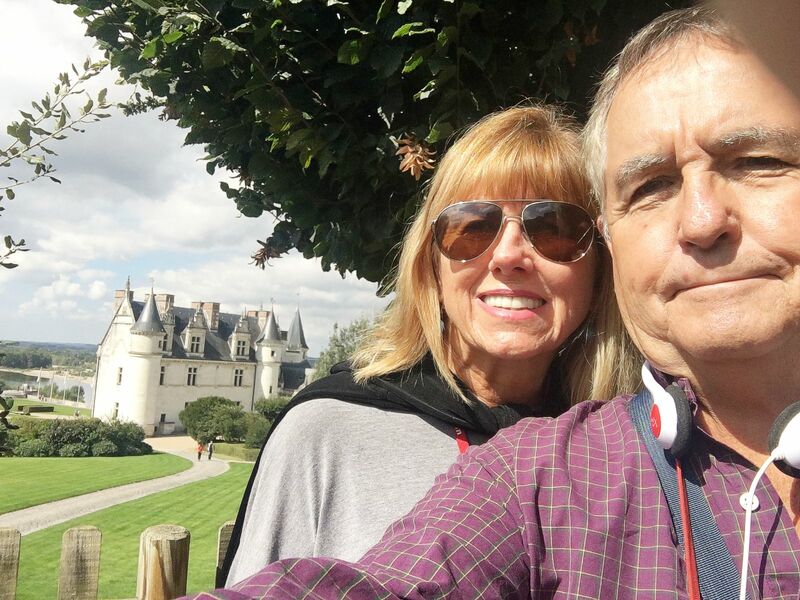 Upon arriving at the chateau, about ten miles east of Amboise, we learned that there was a classical music festival on the grounds, so our serendipitous day just kept getting better and better. On our way to listen to a Brahms performance we passed the first of many beautiful art pieces we would see on the grounds and in the buildings. 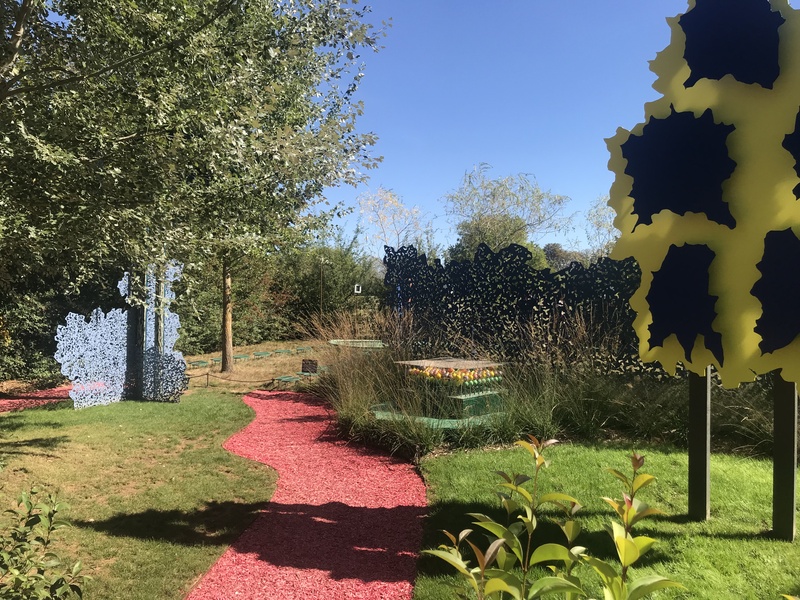 After the musical performance we walked around both the permanent and festival gardens. 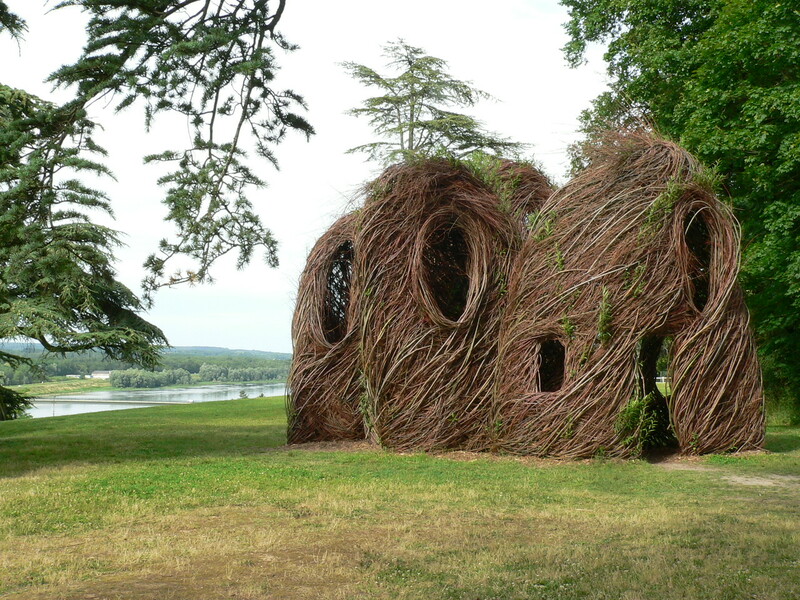 Patrick Dougherty, who had an installation at the Sarasota Museum of Art, had an installation in the historic garden. 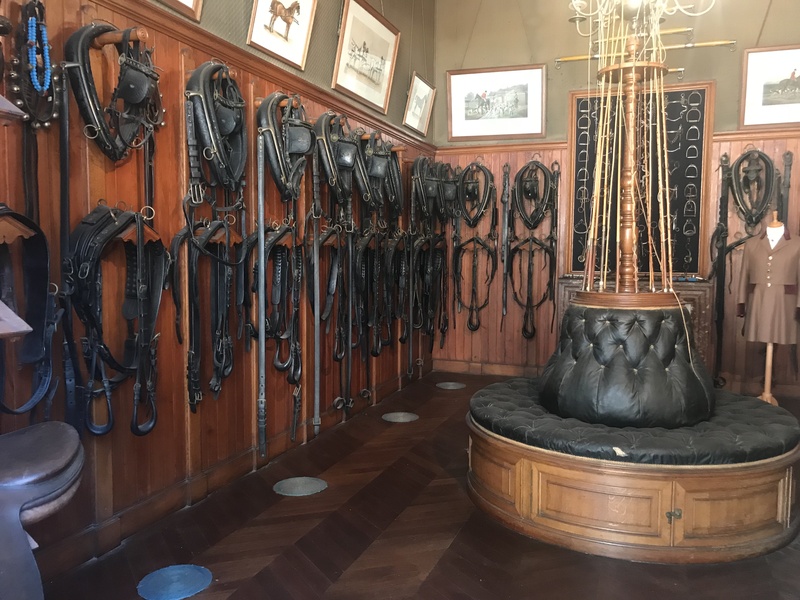 The stables were nicer than many homes, and the harnesses were made by luxury designer Hermes. 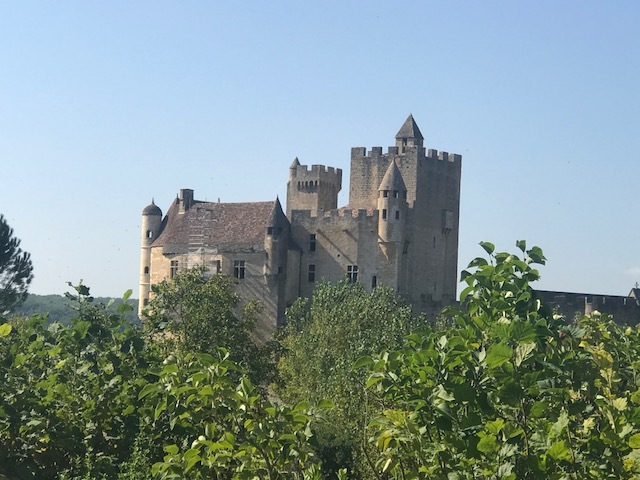 The chateau was founded in the 10th century and most of the rooms were in need of repair. Few of the restored rooms were furnished. 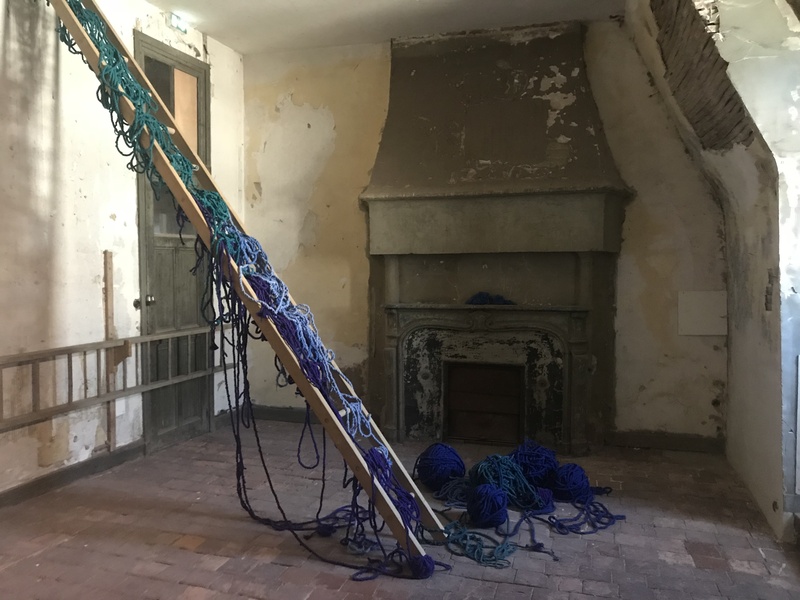 The art installations in the chateau were an interesting contrast with the neglected rooms. It was a wonderful day of beautiful nature, music, art and design. Paul put together a sampling of our day. 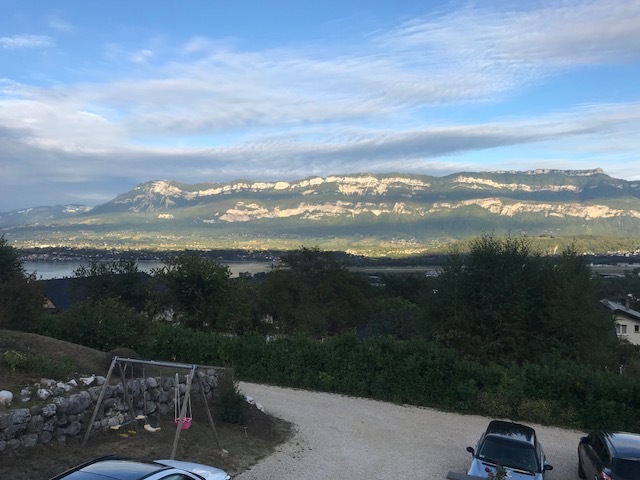 This entry was posted in France 2018 on September 15, 2018 by debbie. 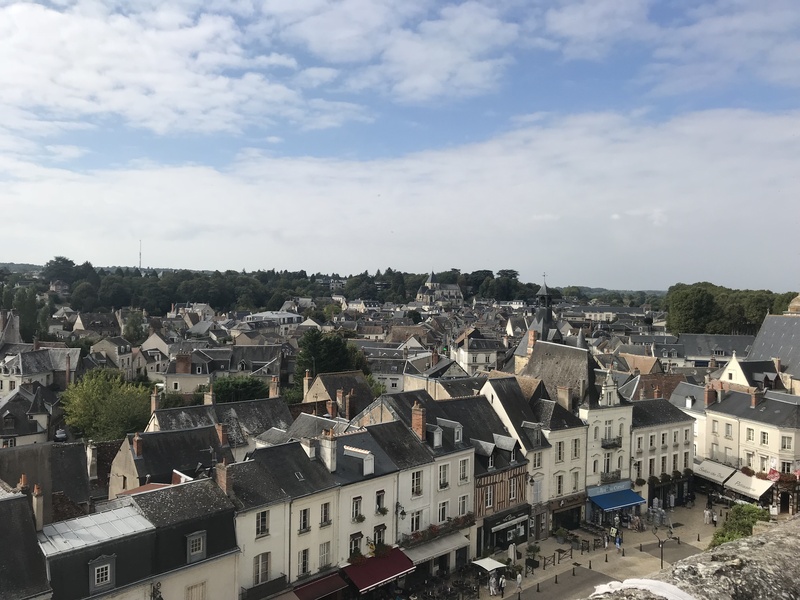 We are so thankful that a friend who lived in France for thirty-five years suggested that we put Amboise, a town in central France’s Loire Valley, on our itinerary. As soon as we drove in to the charming city, we knew we would love it. 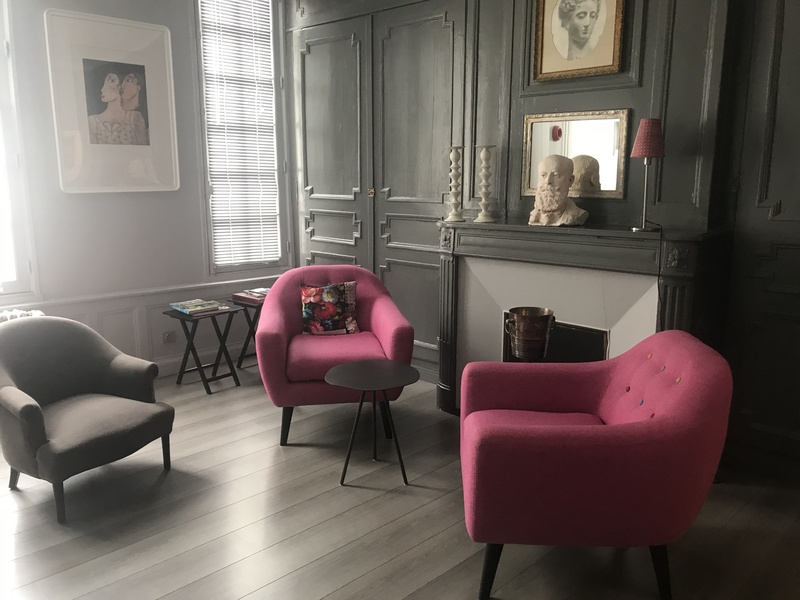 Our adorable apartment is on Rue National, a pedestrian street in the heart of the historic district. 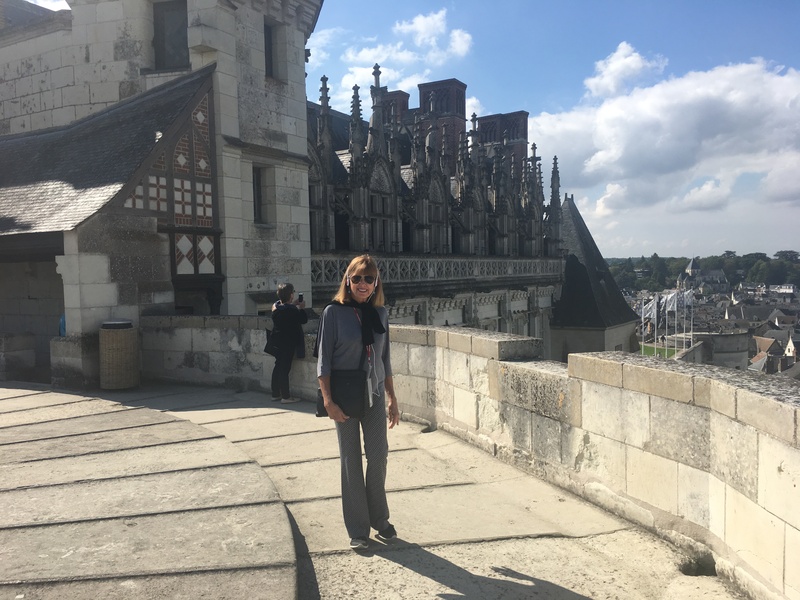 Our first visit of the day was to the Chateau d’Amboise, a residence for French kings from the 15th to the 19th century. 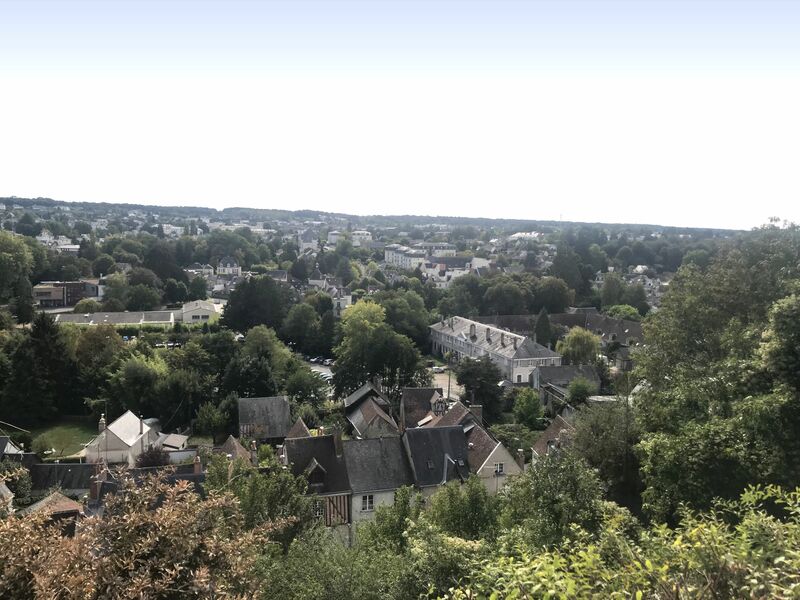 Located right in the city, its towers offered us amazing views of the Loire River and city below. 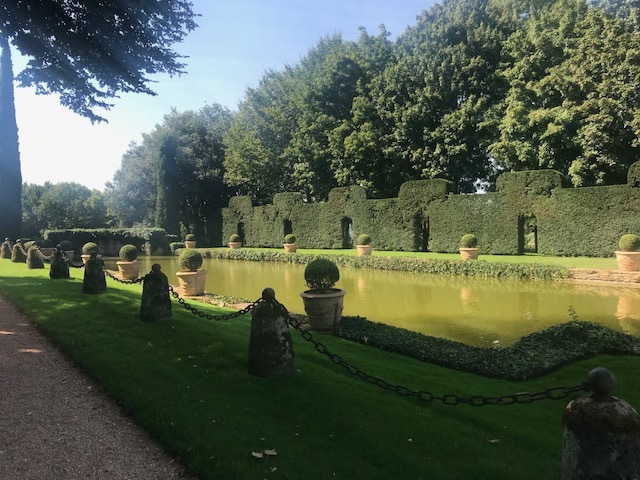 Although the rooms were not as lavishly furnished as some chateaus, the building and grounds were beautiful, and it was fun to imagine how people lived there. 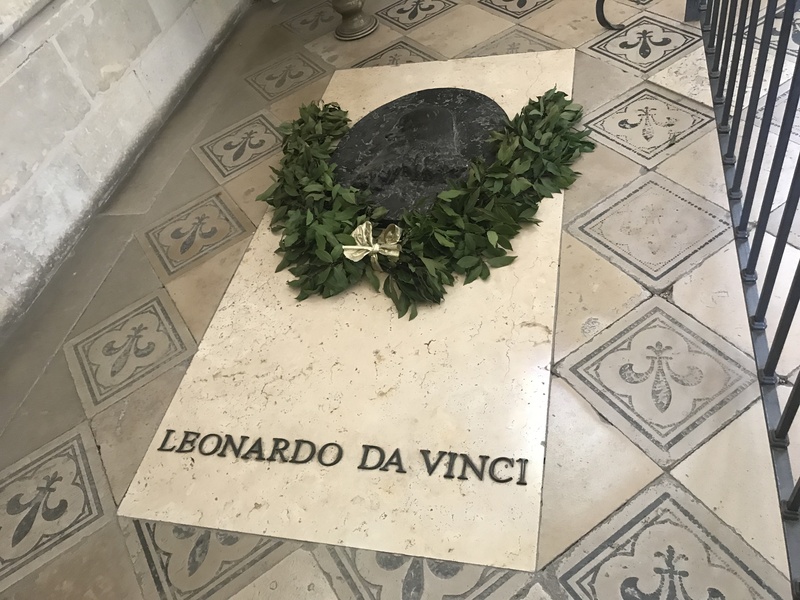 In the 16th century, King Francis I invited Leonardo da Vinci to to come to the chateau where he lived and worked in nearby Clos Luc until his death three years later in 1519. 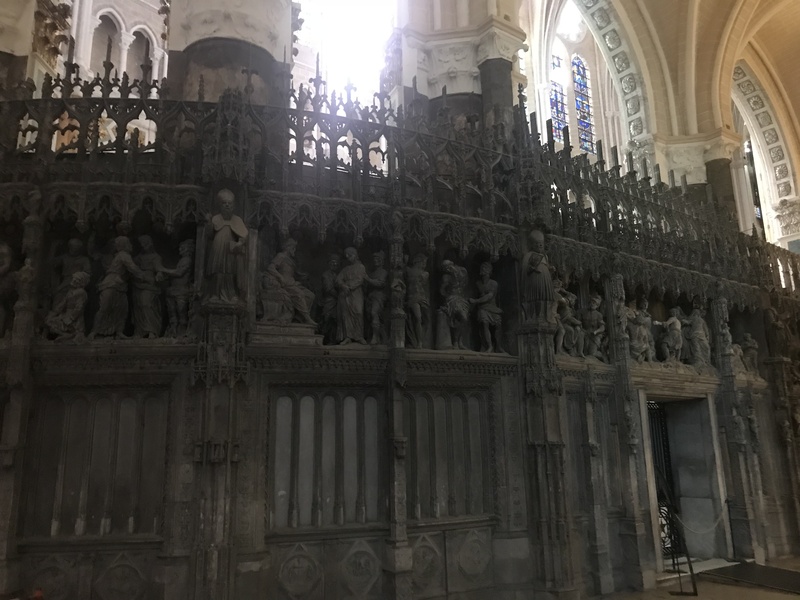 His remains are supposedly buried in the Chapel of Saint-Hubert on the chateau grounds, but there is some question about their authenticity. I discovered a new favorite food at lunch. 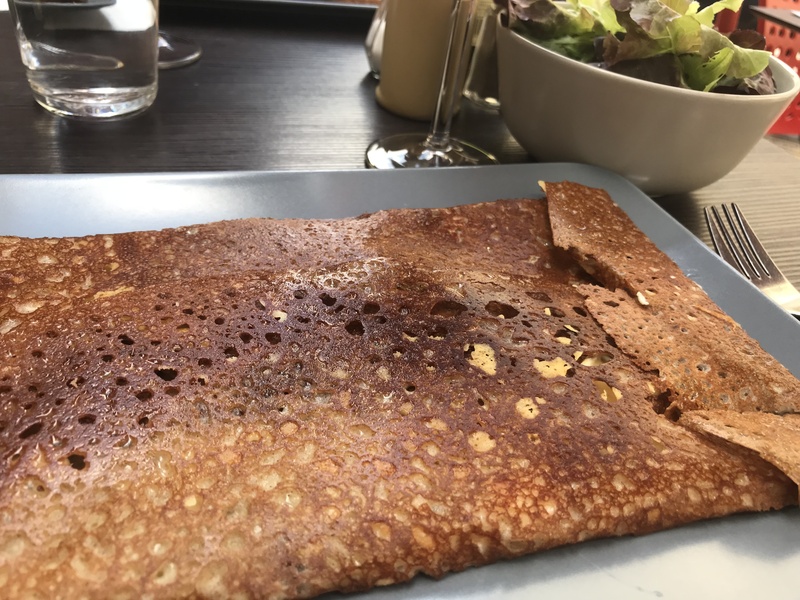 A Breton galette is a type of buckwheat flour pancake with a savory filling. My galette was filled with three cheeses and Paul’s had the kind of Mexican ingredients found in a taco. 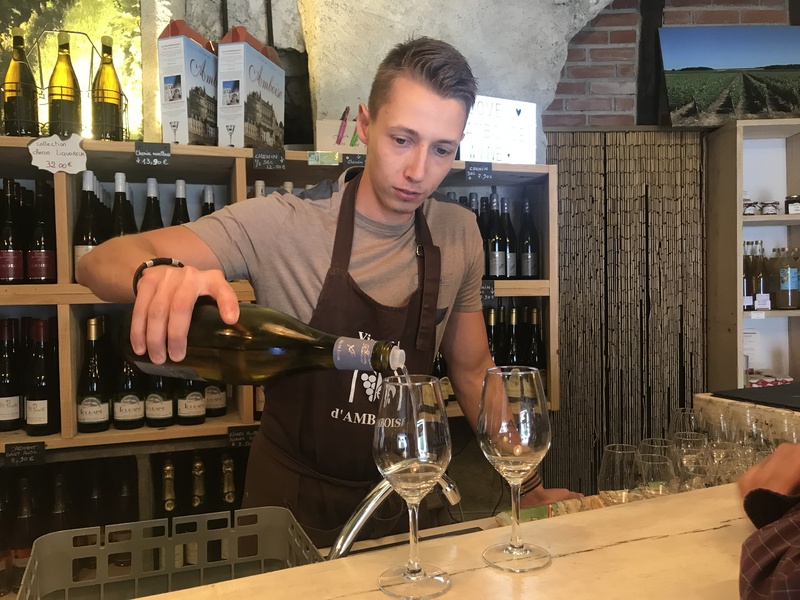 Our lunch waiter recommended that we visit Caveau des Vignerons d’Amboise a wine shop across the street that is located under the chateau that specializes in local, small-production wines. 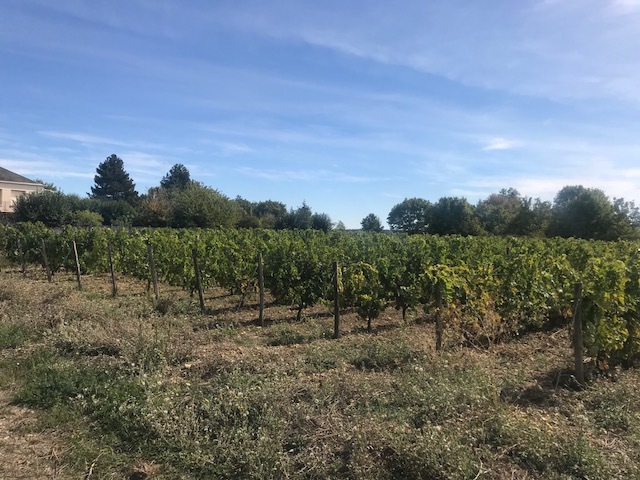 I later read a review that said they no longer offer tastings, but we were able to taste a number of wines and learned a lot about the area. Wine with lunch, wine tasting right after lunch, and then on to our next stop, wine tasting at Les Caves Duhard. 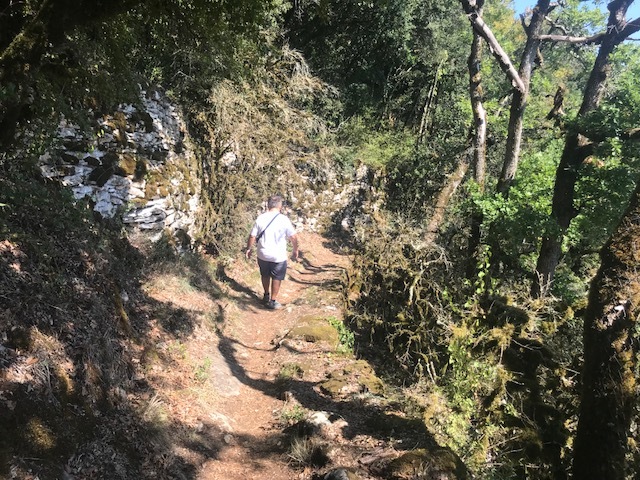 Our scenic route to the caves took us by the river, up hills and through narrow streets. 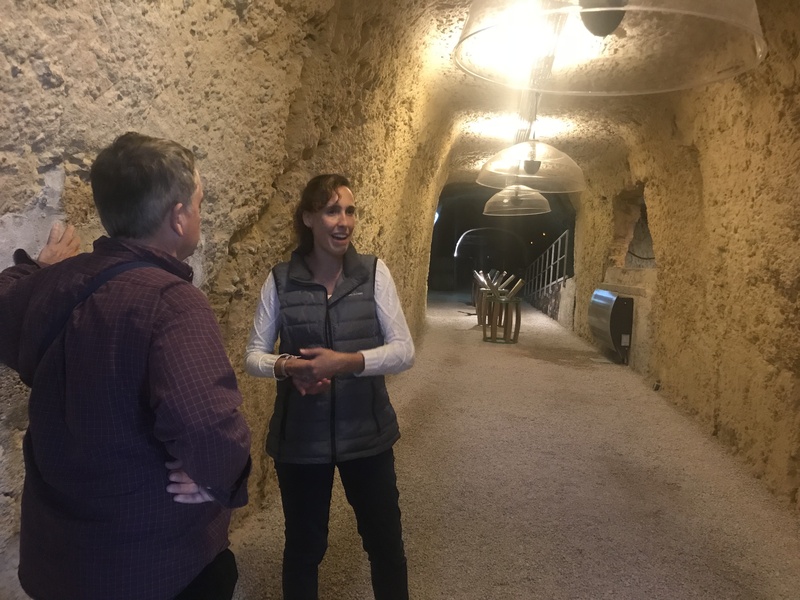 The winery is located in caves that were left as a result of excavating limestone used to build the chateau and other buildings. 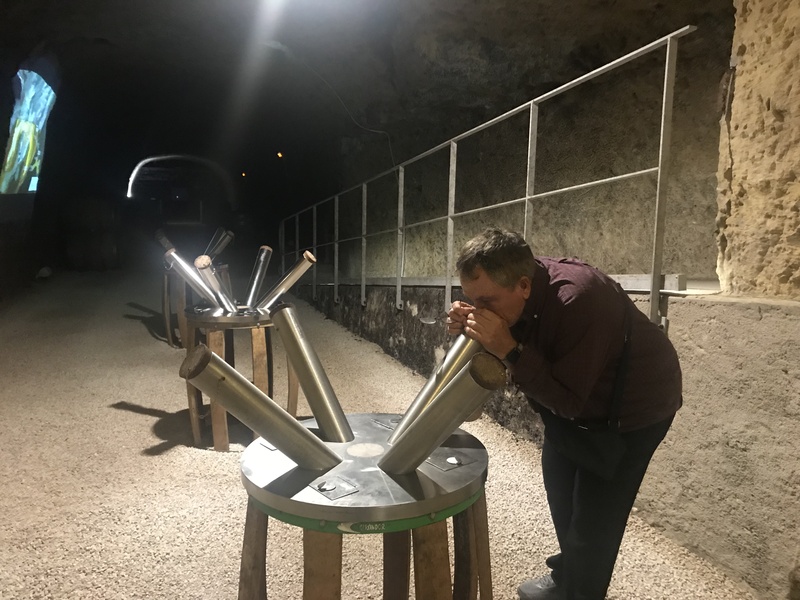 The caves provide consistently perfect 50 degree temperature and 80 percent humidity for storing wine. We were lucky to have a private tour from two very knowledgeable and charming sommeliers. Our tour felt like a mini-lesson in wine tasting. We had a great experience trying to identify common wine scents. After I asked some questions about champagne, our sommelier opened two bottles of champagne for us to compare, one from 2015 and one from 1997. 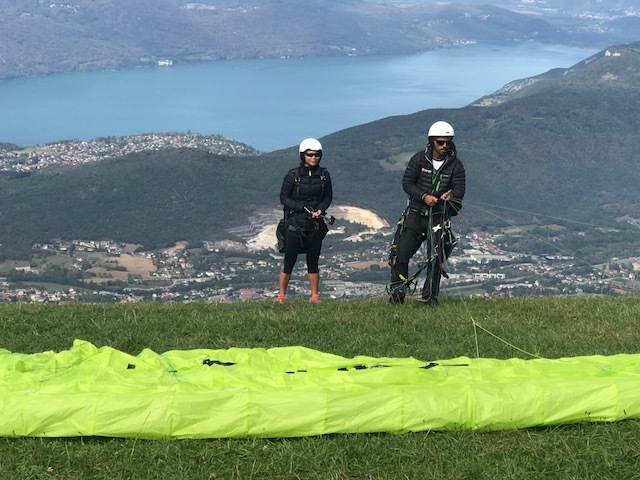 This entry was posted in France 2018 on September 14, 2018 by debbie. Au revoir, dear Paris. 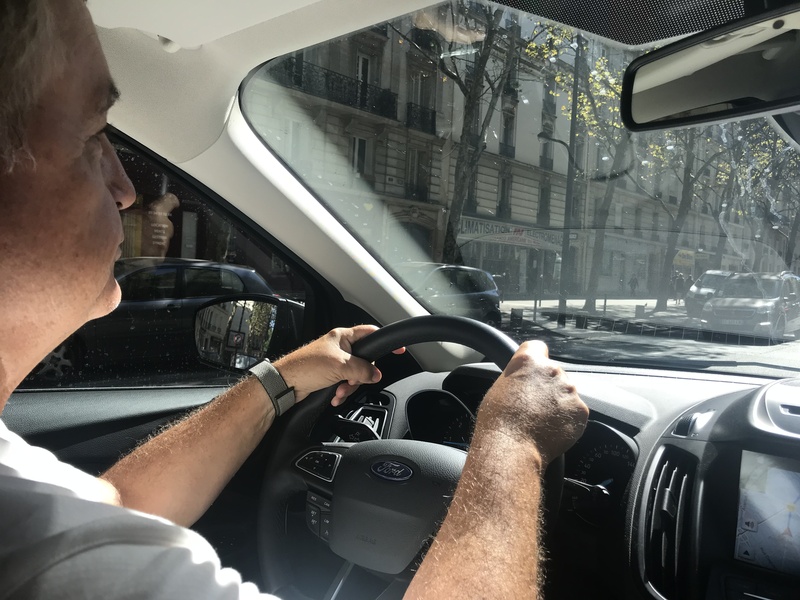 After a week of successfully plotting our metro and walking routes all over Paris, my dear husband successfully drove us through the narrow streets of Paris and on to Chartres. 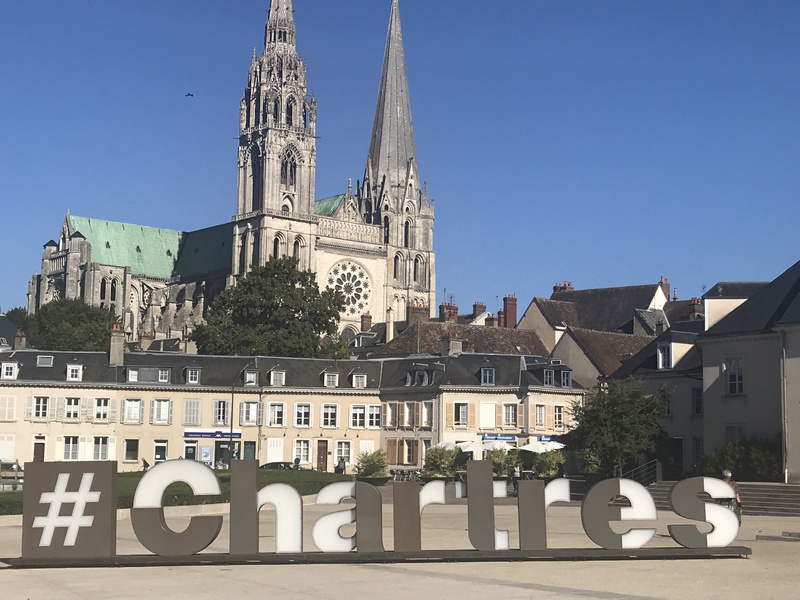 Chartres, our home for the next two days, is a charming little town of 40,000 people about an hour south of Paris. 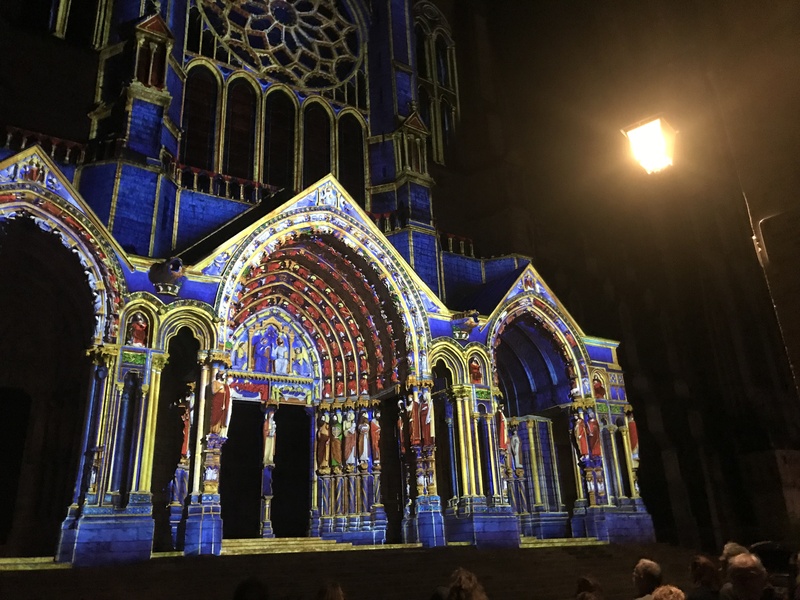 We arrived in the late afternoon and after a lovely dinner on one of the plazas enjoyed the Chartres en Lumieres, an impressive light and music show that adorns twenty-four sites each evening from mid-April to mid-October. 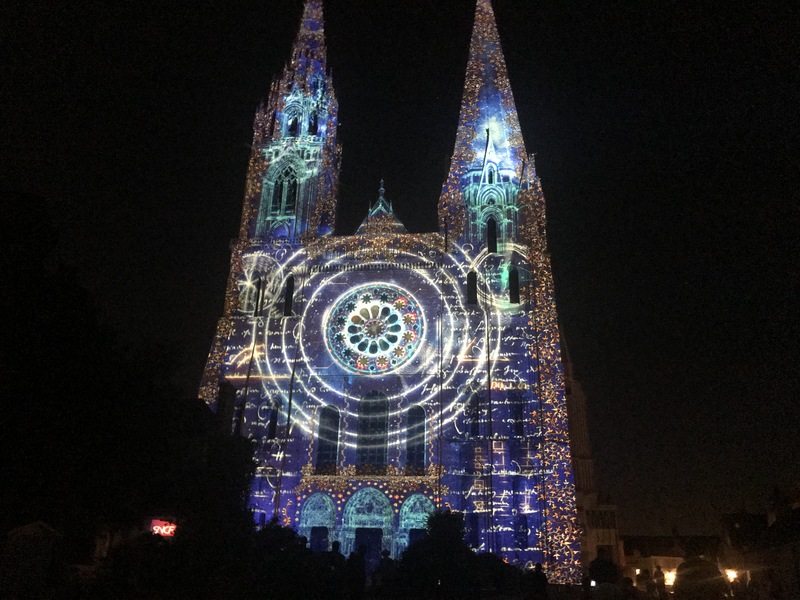 Chartres was the first city to highlight its heritage with light and is now part of LUCI, the international network of cities on urban lighting. 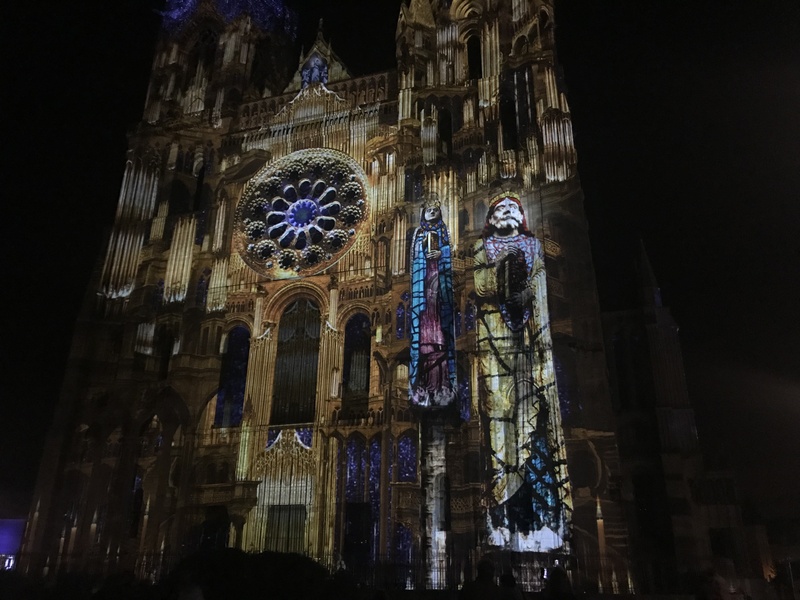 By combining modern technology with ancient heritage, the city has created a stunning display. I don’t totally understand the technology that projects beautiful, changing designs, but the results are magnificent. 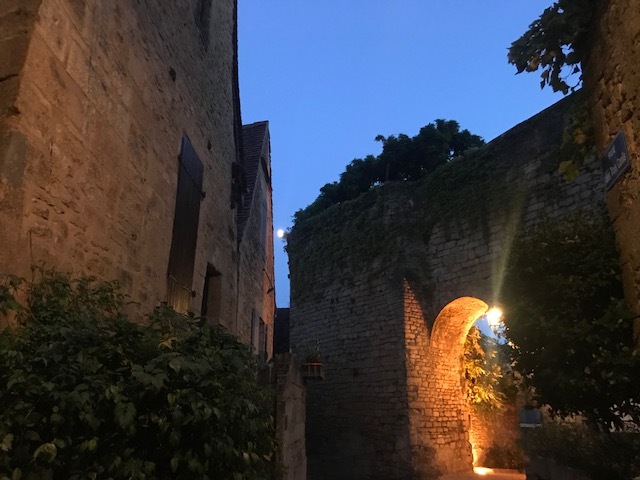 Although we had a phone app that helped us locate the sites, it felt like a treasure hunt, walking around looking for the light and music shows. The next morning we explored other places in this beautiful little town. 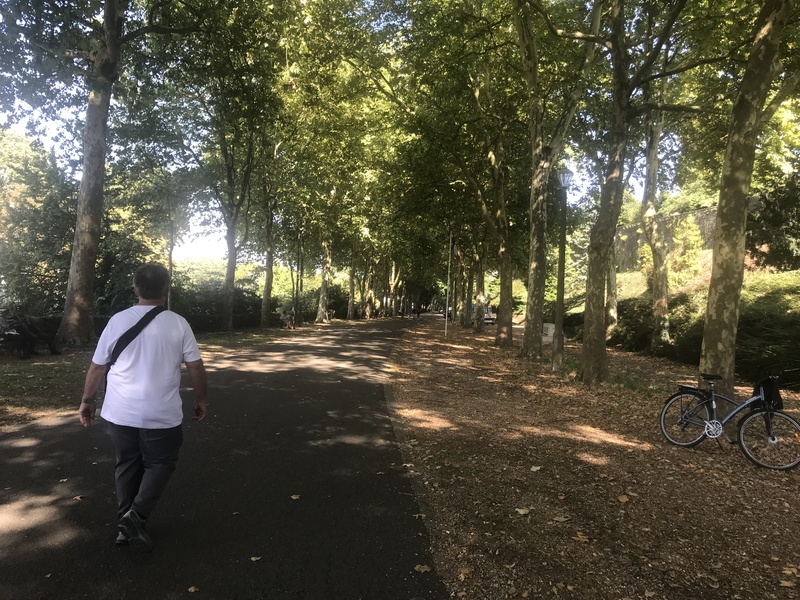 Paul found a wonderful walking tour that took us to a shady park, quaint areas and narrow streets. 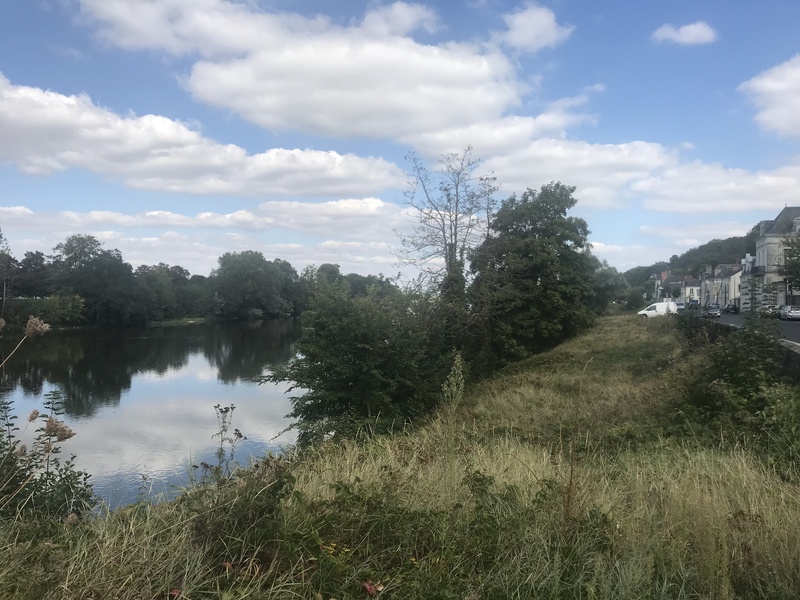 As we were crossing the Eure river, a charming French man stopped his bike and told us about a little path that would take us to the river’s bank. Luckily I understood him well enough to find the little path. 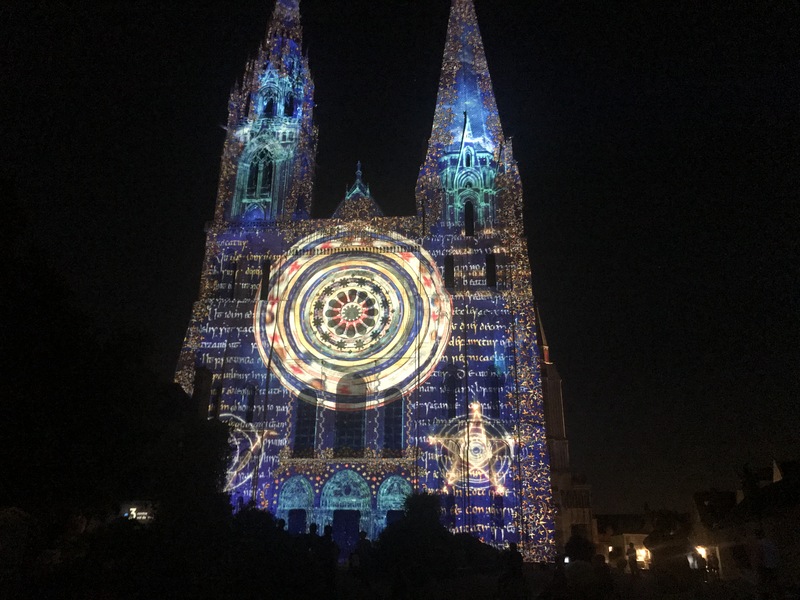 Of course, Chartres’ main claim to fame is the beautiful Chartres Cathedral, home to the largest collection of medieval stained glass windows in the world. 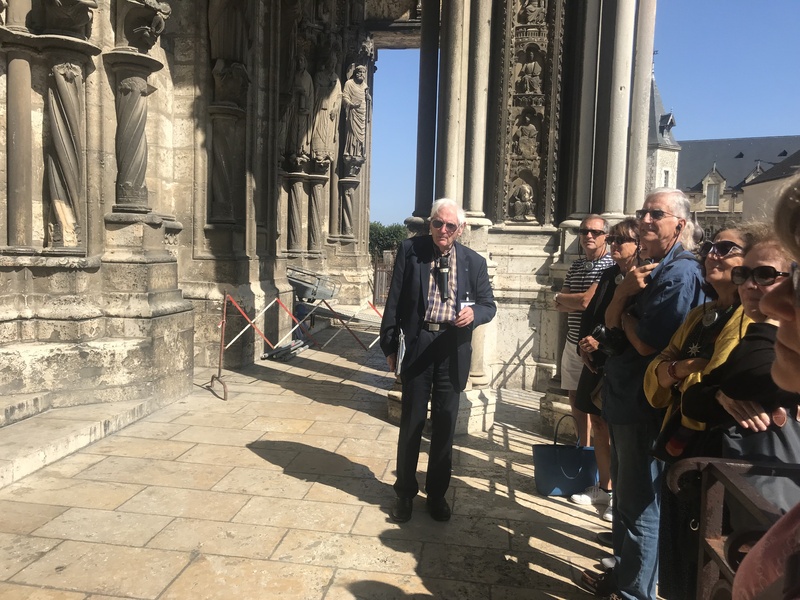 Fortunately, we were able to schedule a tour of the cathedral with Englishman Malcolm Miller, recognized as the greatest authority on Chartres Cathedral, who has been studying it for more than sixty years. I had read that he was a bit quirky and sometimes decided that he would not give a tour, so I was happy when he appeared and our tour began. His proper style and dry humor were as entertaining as the knowledge he shared with us. 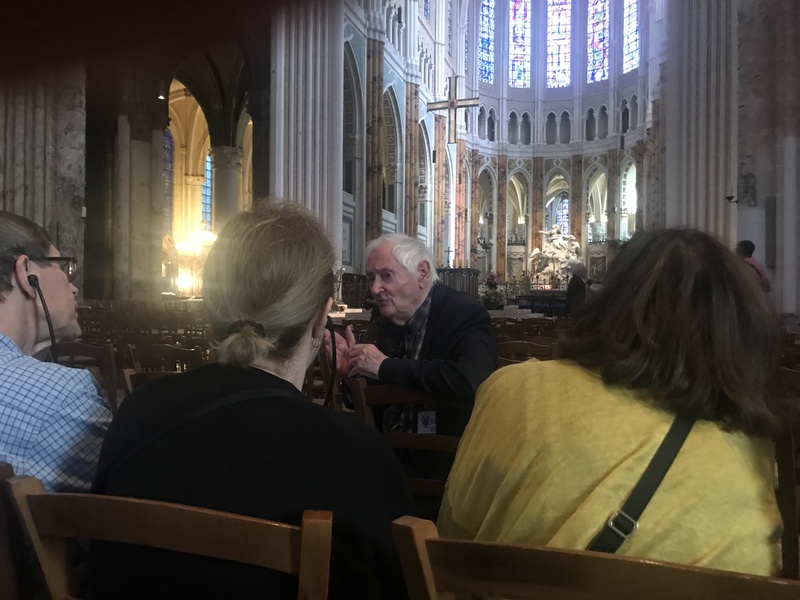 We learned so much about the architecture, windows and restoration in the 90 minutes we spent with him. 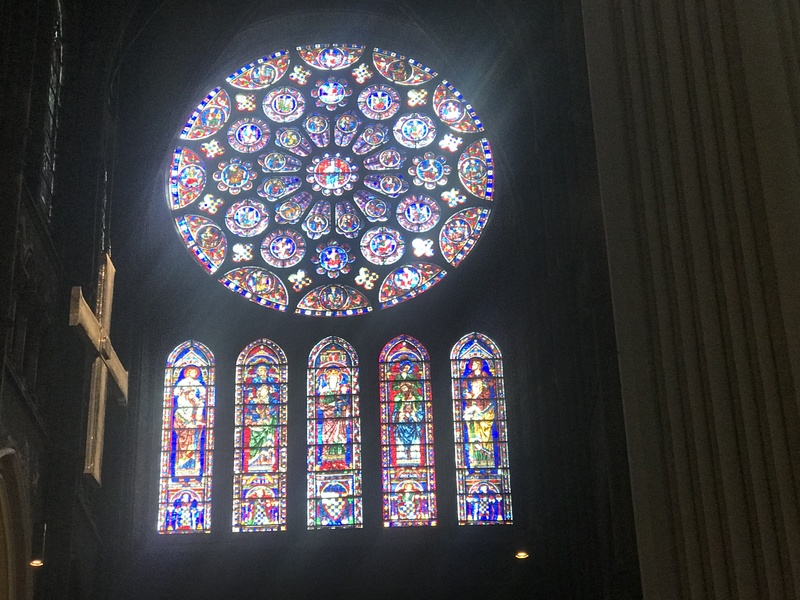 The cathedral is in the middle of a controversial renovation that is cleaning off 800 years of grime and restoring the walls to their pale ocher color. 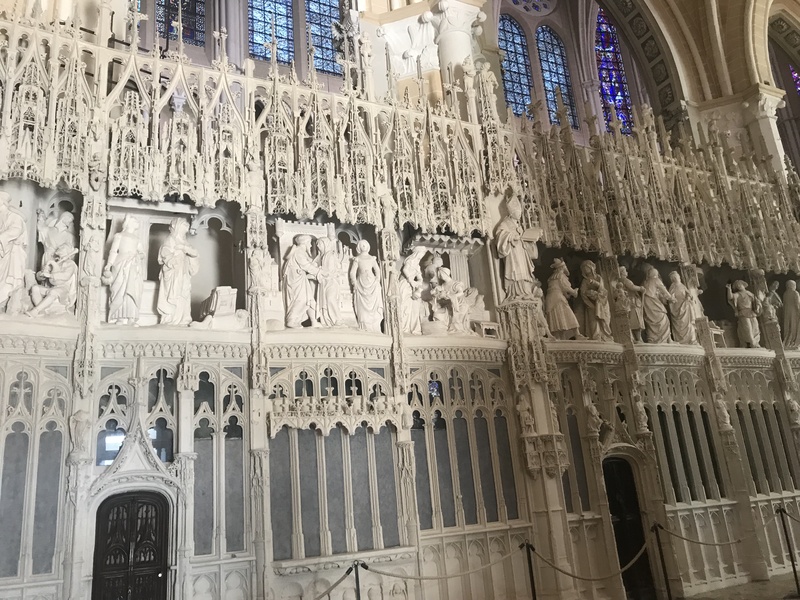 Some critics believe the renovation is removing the “patina of history”, but Malcolm Miller says, “rubbish”; the cleaning is restoring the cathedral to its original beauty. We saw dramatic before and after examples of the renovation. 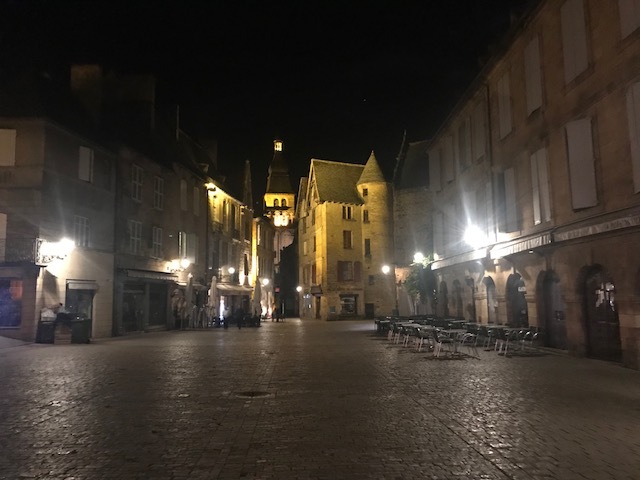 This entry was posted in France 2018 on September 12, 2018 by debbie. Last night we had our final Paris dinner with friend Scott before he left for home this morning. 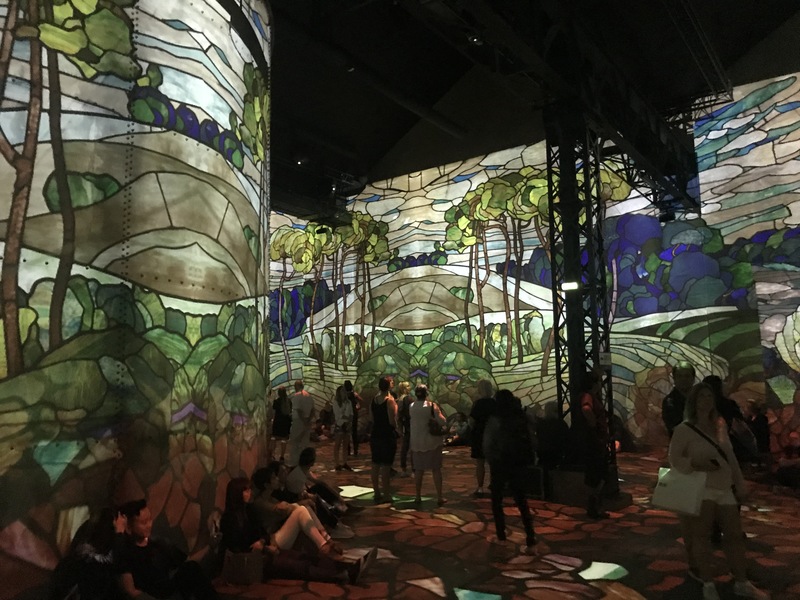 We spent our last day in Paris at a wonderful new art museum in Paris, L’Atelier des Lumieres. 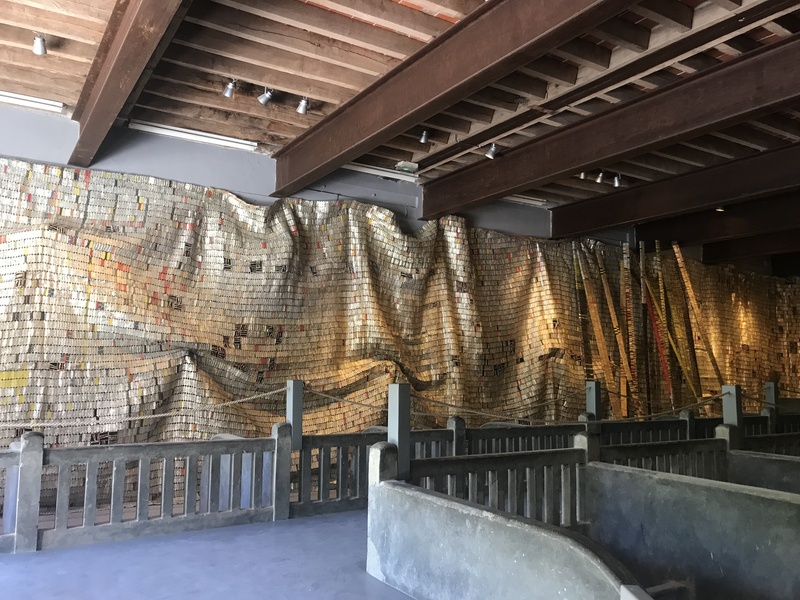 Opened in April, 2018, the digital art museum is housed in a former iron foundry. 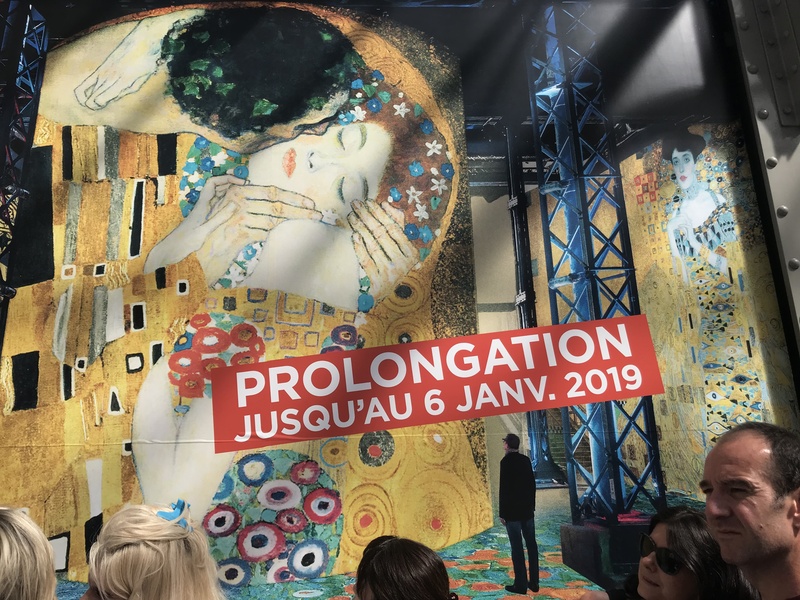 The first exhibit , which has been held over until 2019, is based on the works of Gustav Klimt, a 19/20th century Austrian symbolist painter.. 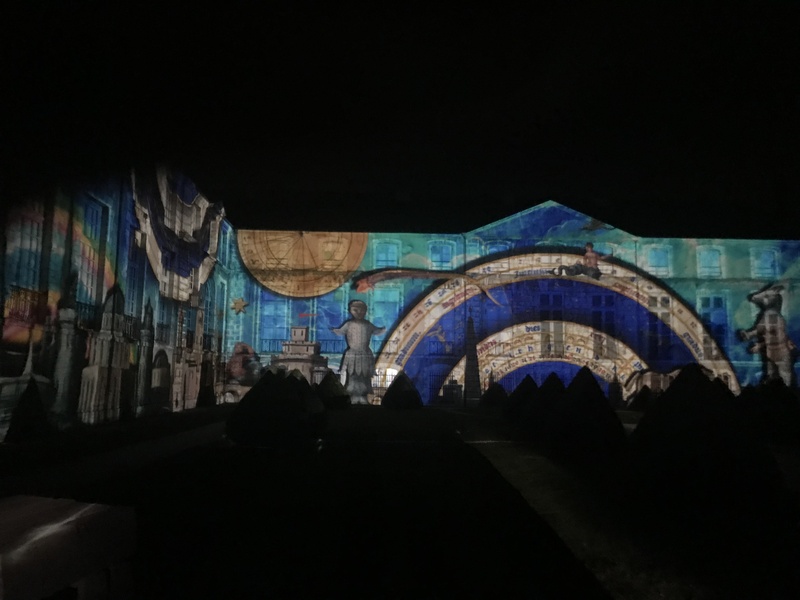 This immersive art experience is a combination of Klimt’s works projected by 140 laser video projectors onto concrete walls in a huge space accompanied by music from fifty speakers programmed to complement the visual experience. 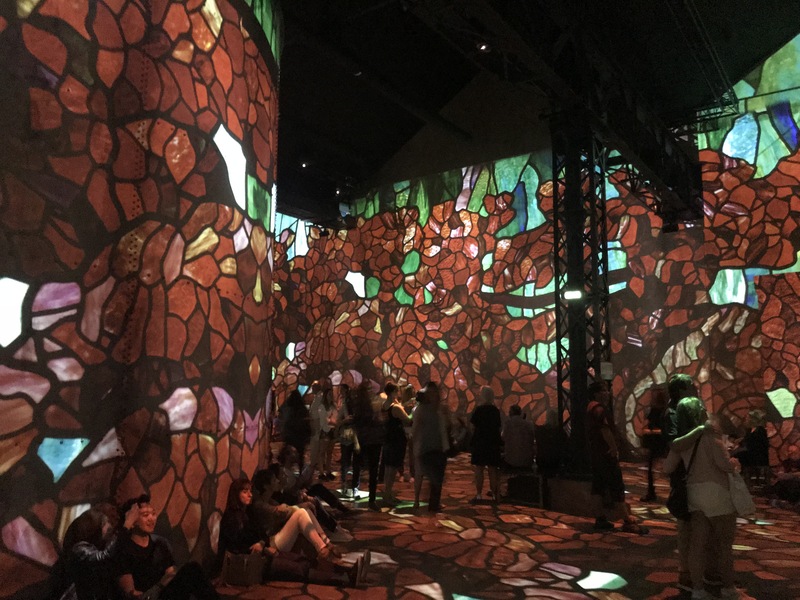 It was pretty amazing to be surrounded by the beautiful images and music. We especially enjoyed it once we were able to get one of the few seats available. 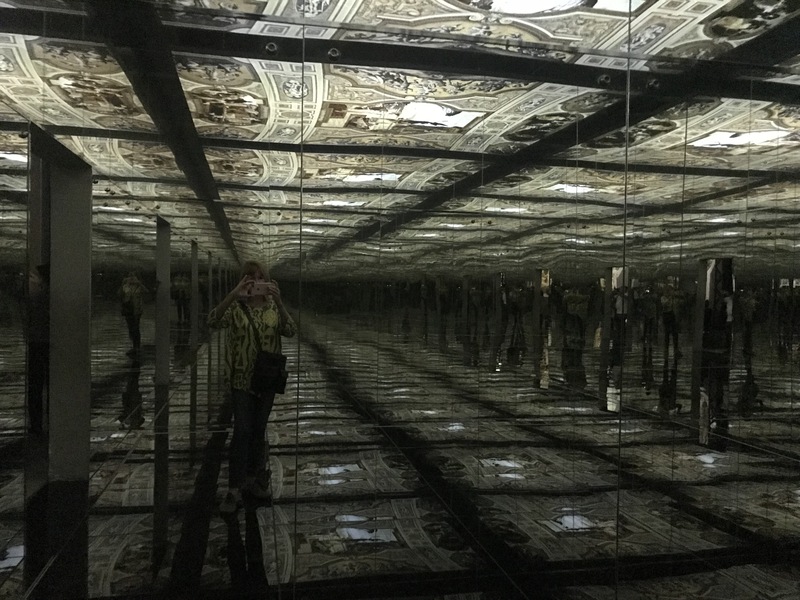 One of the spaces felt like a house of mirrors to me as I walked on what appeared to be a room without a floor. 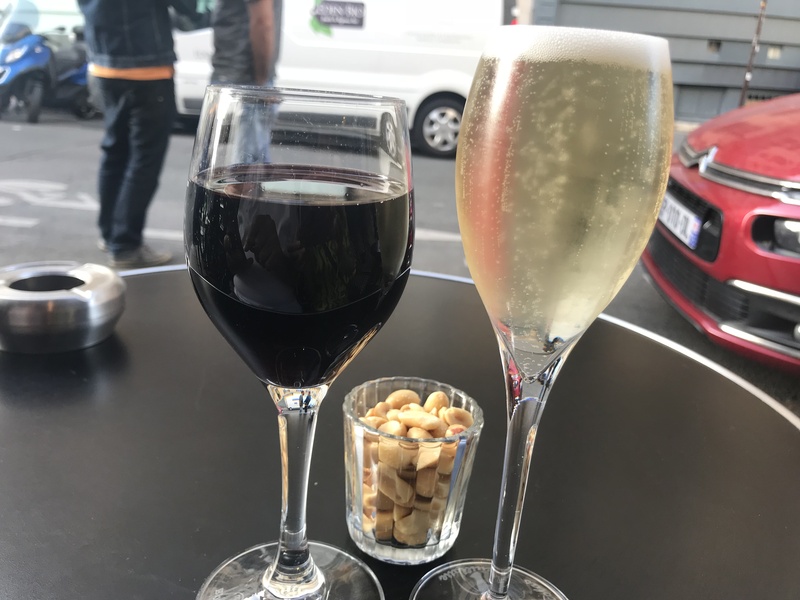 Sitting outside at one of our neighborhood bistros with a glass of champagne was the perfect ending a our lovely afternoon. 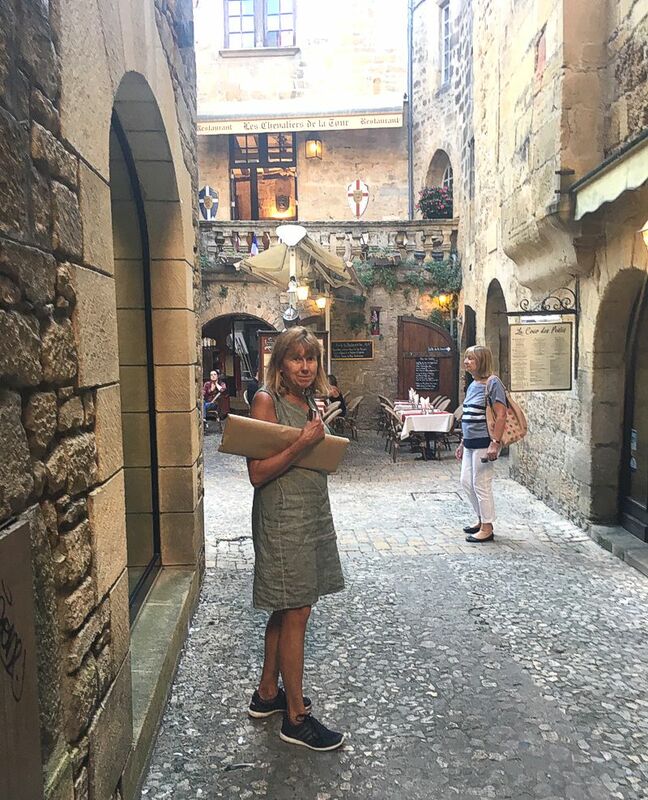 This entry was posted in France 2018 on September 10, 2018 by debbie. Today was our best Paris food day ever with lunch and dinner at our favorite Paris restaurants. 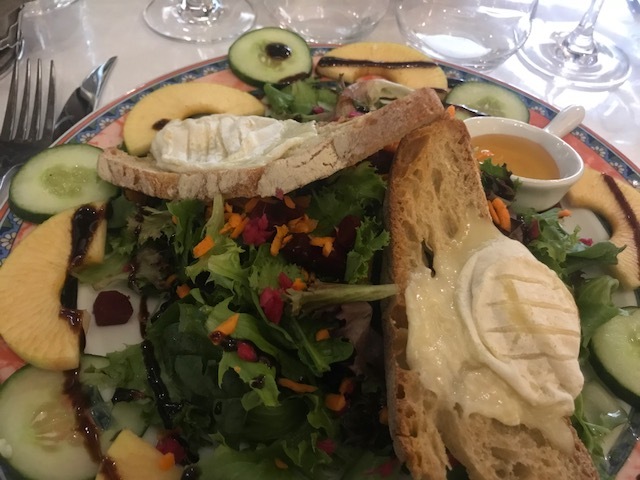 After trying Le Reminet on a friend’s recommendation and loving it five years ago, we always return for a wonderful lunch whenever we are in Paris. 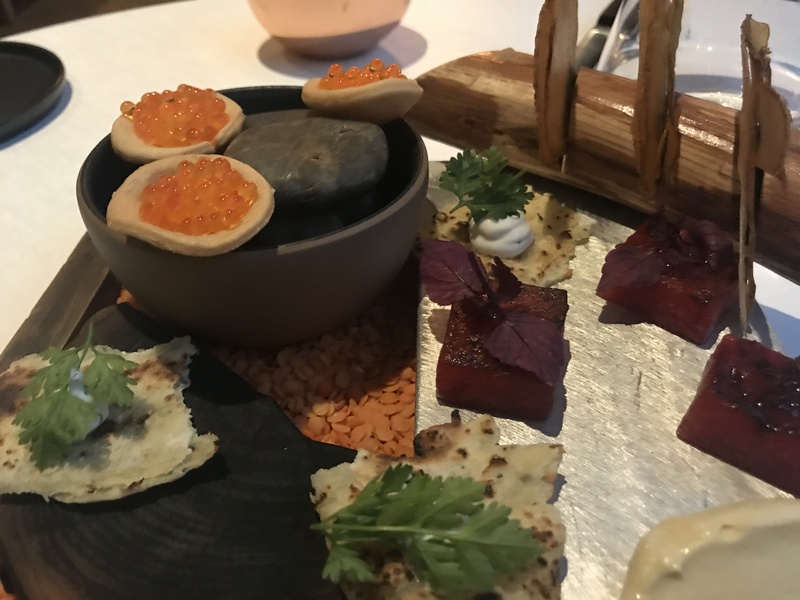 The price for the three-course prix fixe luncheon has increased from 15 euros to 24.50 euros since we started going, but it continues to be one of the best lunch deals in Paris. 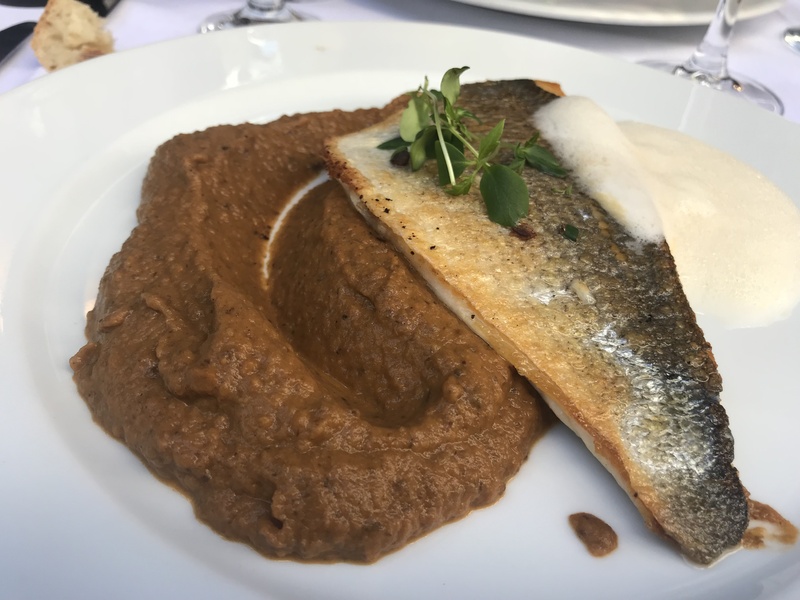 My starter was an amazing broccoli soup, followed by a main course of fish, foamy Parmesan cheese and a four-spice vegetable puree. Dessert was a sublime violet tart (the cream was made with violet flowers) and passion fruit sorbet. The gentle violet cream and intense passion fruit complemented each other perfectly. In the afternoon, we went on a French Revolution walking tour. 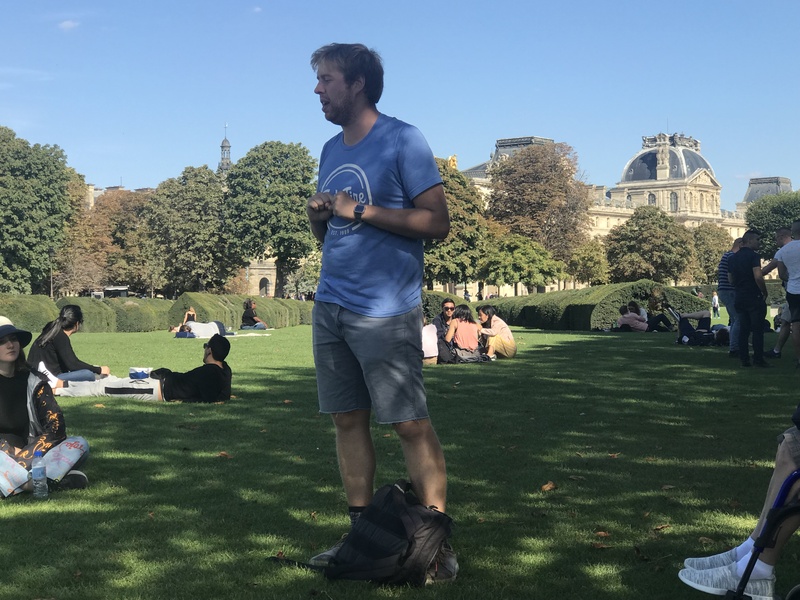 Richard, our Fat Tire tour guide who was completing his PhD in history, did a fabulous job condensing ten years of history into a compelling two-hour presentation that took us to historic parts of Paris. 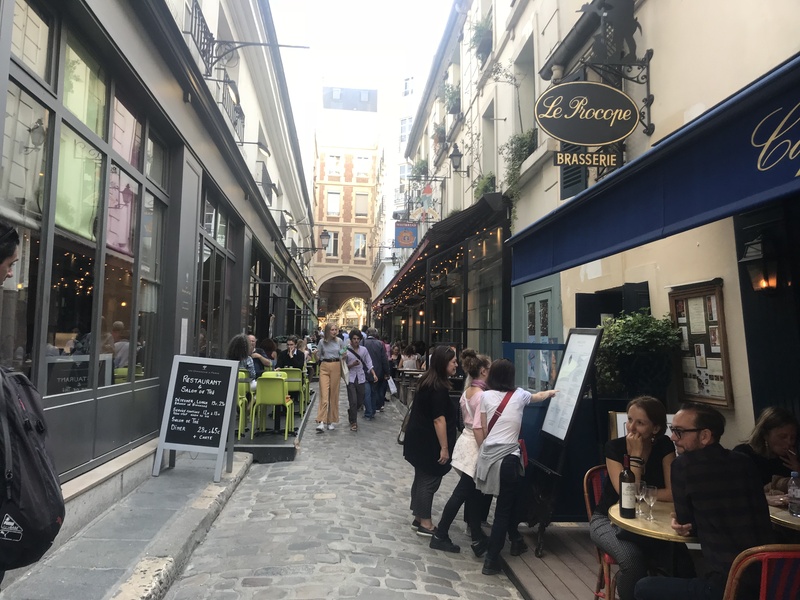 Our tour ended on rue de l’Ancienne Comédie, a small street in the Saint-Germain-des-Pres area of Paris which is one of the few historic areas in Paris that is the same as it was during the French Revolution (1789-1799.) 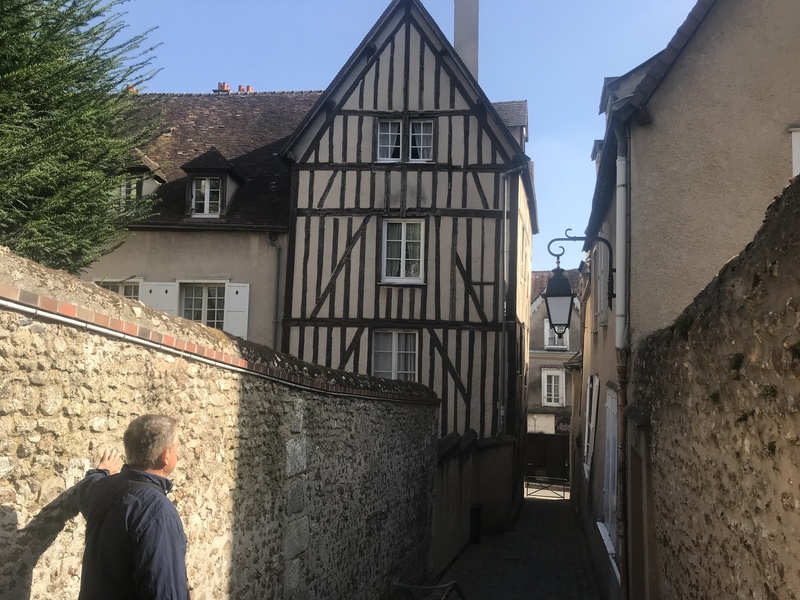 We had visited this charming street on past trips to Paris but never realized its historic significance. 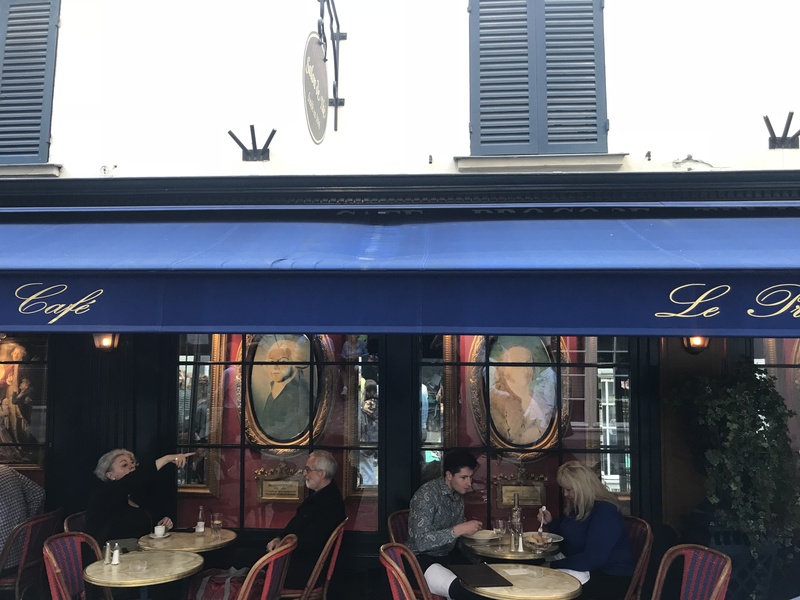 Cafe Procope is the most notable site on the street. Begun in the 17th century, the oldest restaurant in Paris began as a coffee shop. Three hundred years before Starbucks popularized coffee shops, men would gather here to drink coffee, read the newspaper and discuss politics. 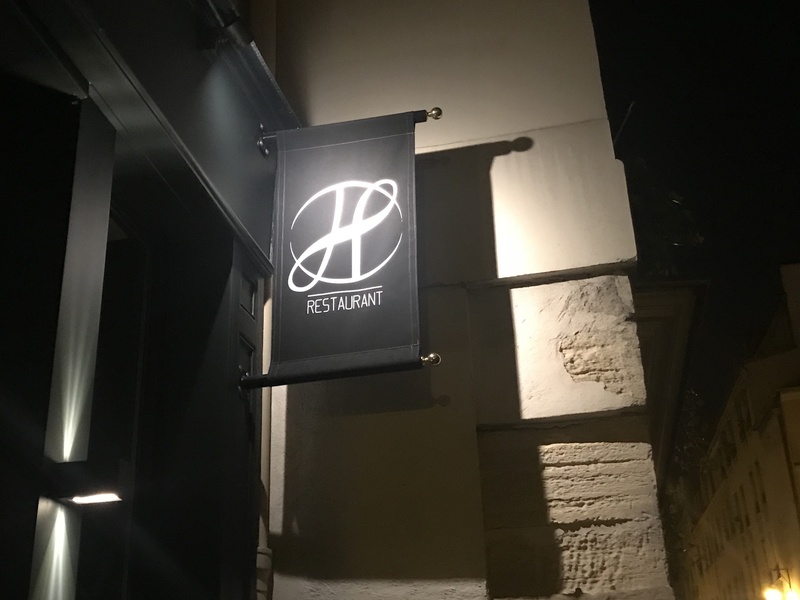 In the evening we had the most intricately prepared and presented meal of my life at Restaurant H. We tried Restaurant H on our last trip to Paris two years ago when Chef Hubert Duchenne had just opened his restaurant in the Bastille area. Since then it has earned a Michelin star and is even better than before. We loved that the same two staff from our last visit welcomed us to the small restaurant which holds about twenty diners and is open for dinner from 8:00 to 10:00. We chose the five-course meal with wine pairing, but with an pre-appetizer, palate cleanser and three desserts, it was really nine courses. The staff presented each course with a detailed description of what it was and how it had been prepared. Sadly, a significant part of the description was lost in translation. The best part of the pre-appetizer was the intense watermelon square. 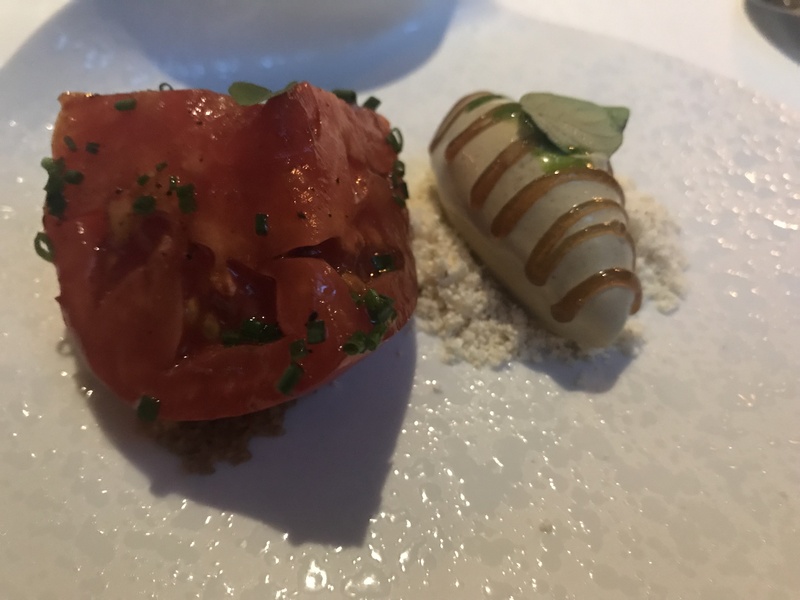 The appetizer was an unexpected combination of marinated tomato with corn sorbet and corn powder. 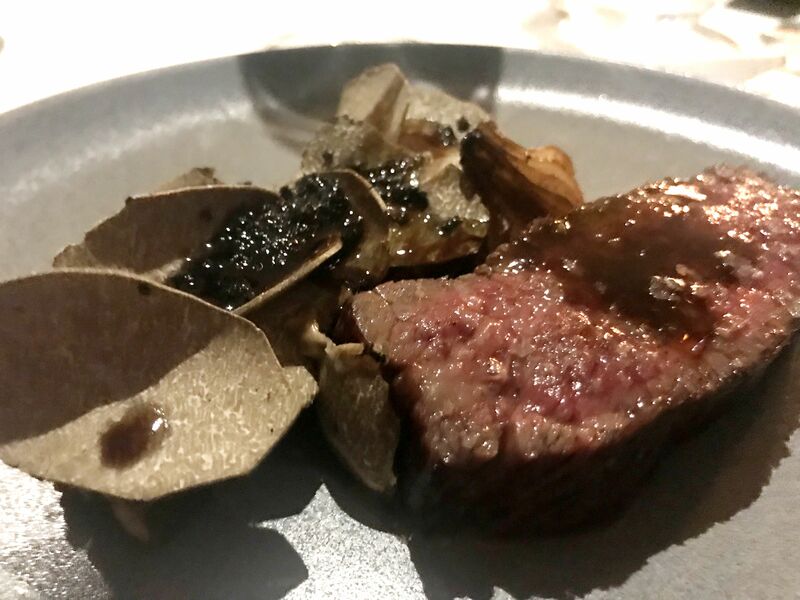 The main course was filet with the taste of barbecue, potato slices that looked like leaves and truffle. 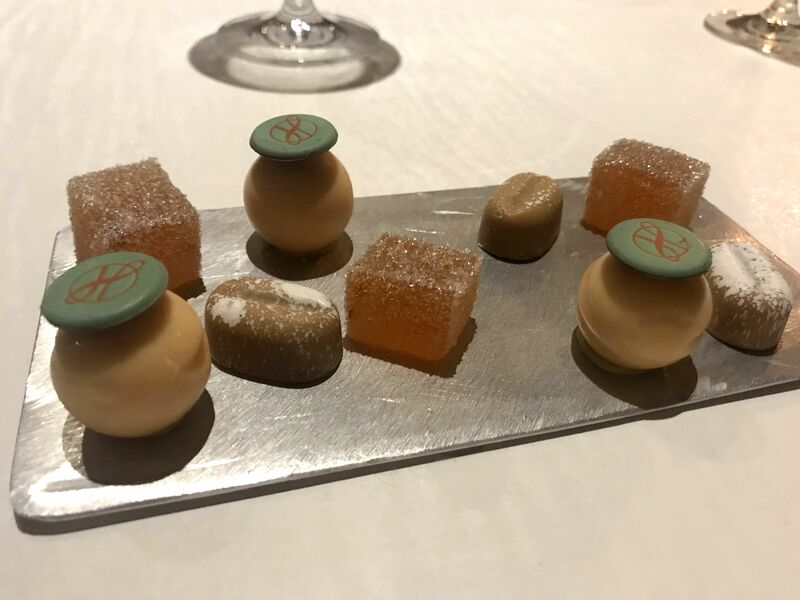 The third dessert was a tray of little sweets that looked too beautiful to eat. 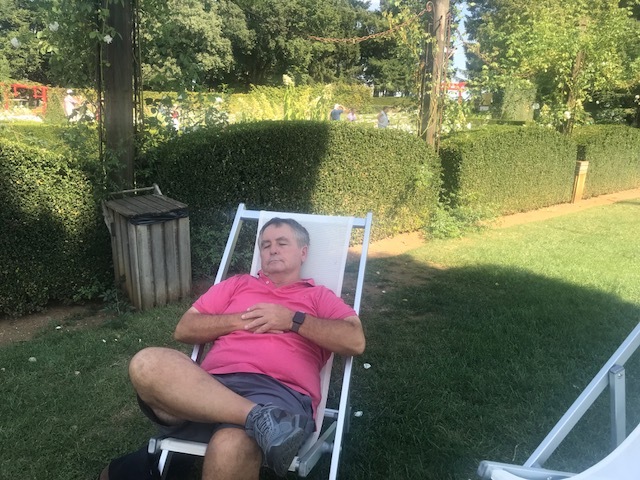 This entry was posted in France 2018 on September 9, 2018 by debbie.